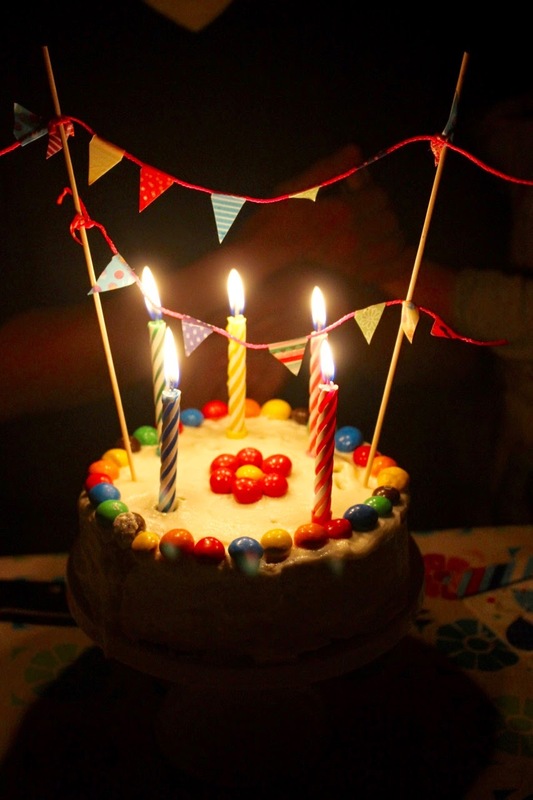 So this blog turns 8 today. 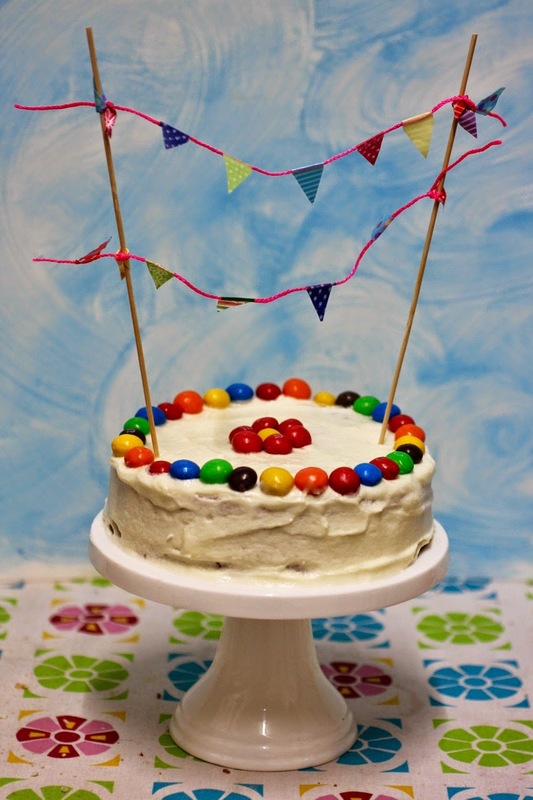 It is my tradition that E's birthday cake is always featured on my blogiversary. His birthday was anticipated with great plans for eating sausage rolls at Luna Park with my family and a treacle tart on the day of his birthday. Instead it was met with rotten weather and ill health. Despite these challenges, we still managed to celebrate with good food and fun. We had planned our trip to Luna Park a few weeks prior and crossed our fingers for good weather. 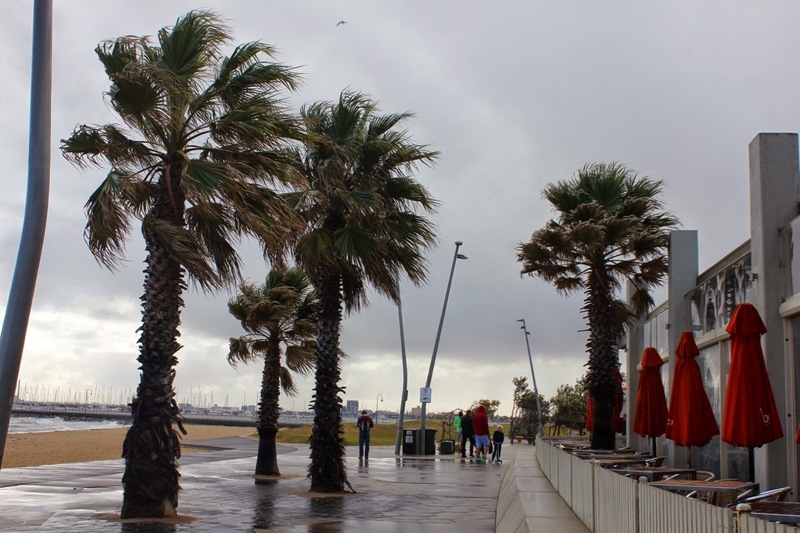 Melbourne's weather can be fickle. On the day before we planned to go out, Sylvia was sick. While we waited for the locum doctor to visit us at home (our first time - it was really useful), I baked sausage rolls and chocolate caramel slice to take with us. I was too hopeful. Then next day it was pouring rain and we had a fluffy of facebook messages about contingency plans. My brother booked us a table at the Beachcomber. It was surprisingly busy. Yet I can appreciate that everyone else wanted to be cosy inside rather than outside in the wind and rain (see above photo). 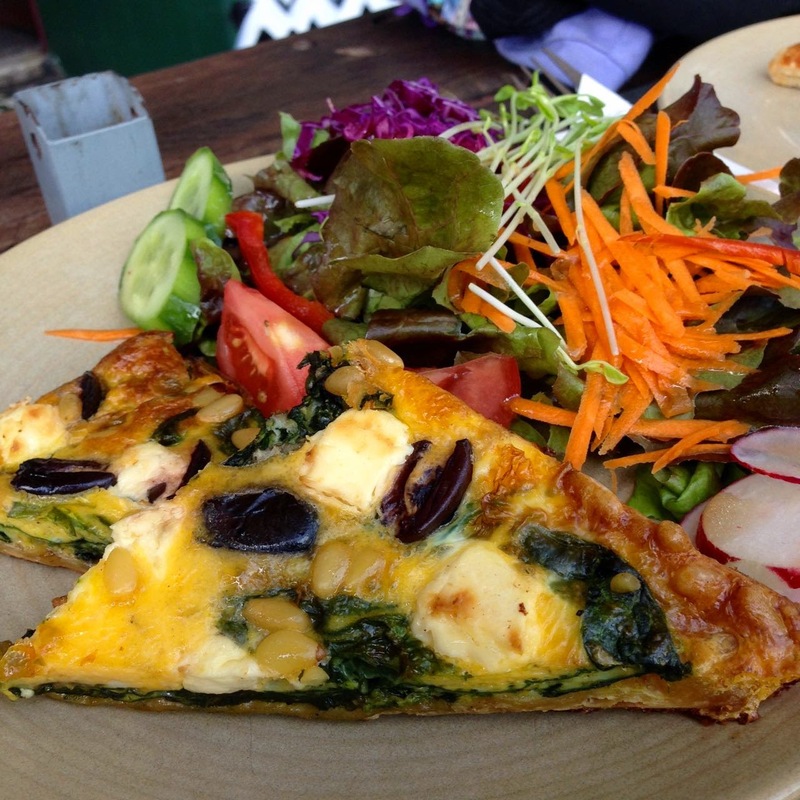 I had a great green smoothie, an average minestrone and shared some of the really lovely haloumi and pita breads. Rather than eating dessert I saved myself for the chocolate caramel slice. 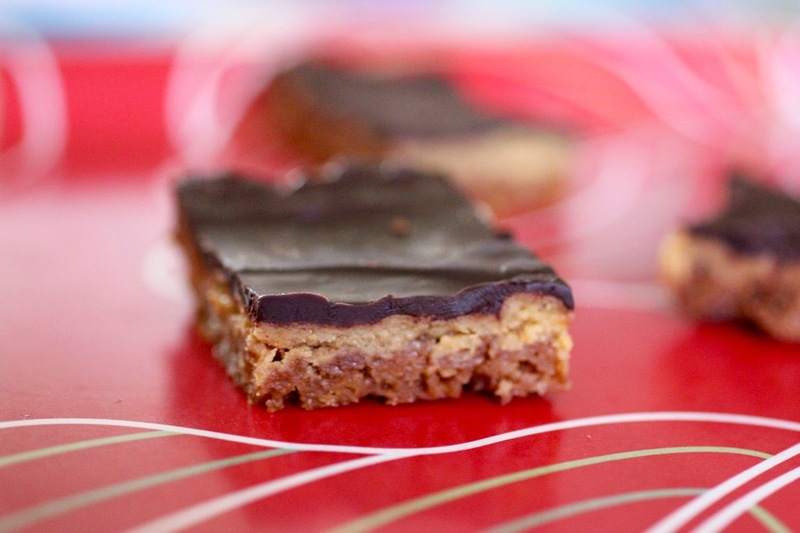 I had made the caramel slice with a blend of gluten free flours. (Check out the post for my notes on the GF version.) I worried I had overcooked it but the next day it was chewy and delicious. I gave some to my family and we made our way through these and the sausage rolls at home. 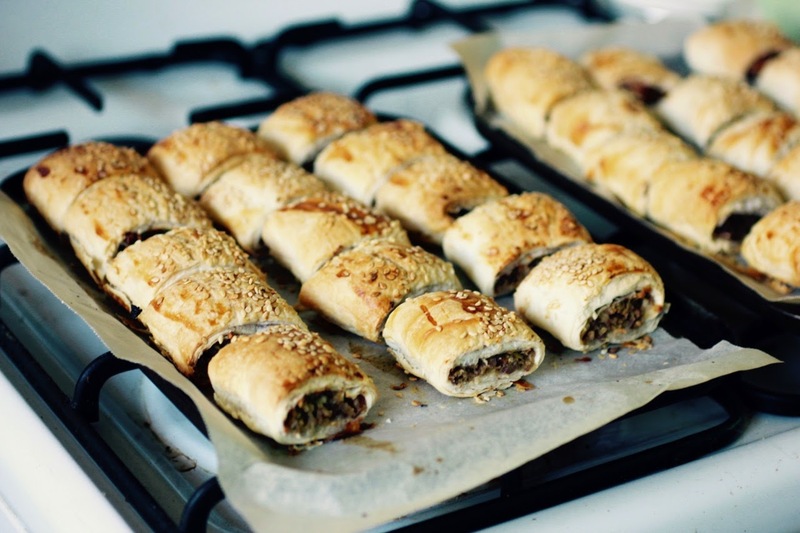 Sausage rolls make great snacks and meals. Even Sylvia loved them. Mostly! A few days later on E's birthday he came down with a cold. Fortunately he was not off his food. I was busy on that day but managed to bake the cake and make a chilli non carne (recipe to come) before I went out. I was making a sponge cake I had made a few times before. E loves it. This time I decided it was a good opportunity to use up some sourdough starter. So I tweaked the recipe and it worked brilliantly. My evening was even more time poor than I had expected as I took a friend of Sylvia's after school. She was meant to come home for a playdate but we got waylaid in the supermarket and before I knew it, it was time for her to go home so - thanks to a communication breakdown - I took her home while her mum was knocking on the front door of our home. 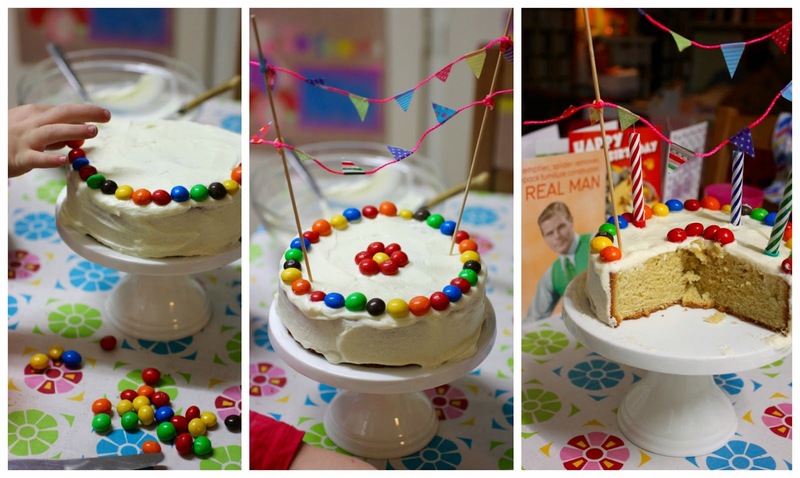 While I chatted to her mum I said I wanted to make bunting to rig up over the cake with skewers. Kerin is great with craft projects. Before I knew it she had coloured string and washi tape and we were taping small strips of washi tape around the string and cutting it into triangles. It is always more fun to do this sort of thing with a friend and I suspect I might have just run out of puff if I had been doing it myself at home, so I was most grateful for her help. Back at home I wanted to put smarties around the base of the cake but Sylvia was adamant that they would go around the top and as a flower in the middle. Sometimes it is better to let kids develop ideas than to go with the original plan. We had a delicious dinner. 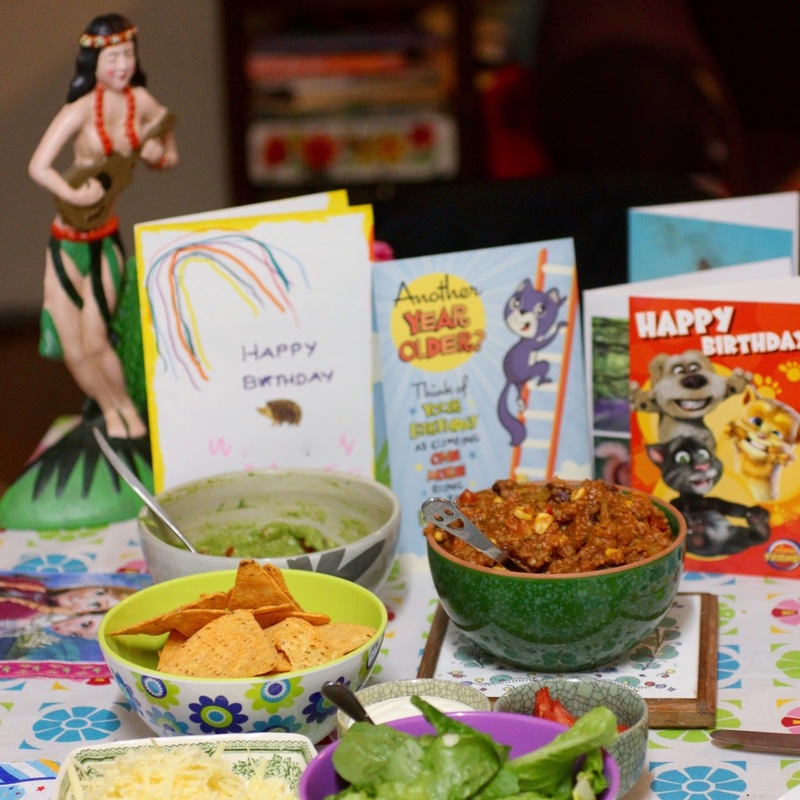 The chilli non carne was delicious with tortillas and lots of extras. The cake had lots of really soft buttercream because I just put some margarine in a bowl and mixed icing sugar in until I couldn't bear to add more sugar. We sang happy birthday, E blew out the candles and Sylvia sliced up some wedges of cake. Fresh sponge cake with soft buttercream is exactly what E loves and he was delighted. The sourdough didn't make a huge effect on the flavour. It was more for using up starter than affecting the taste. It is a small cake so it was gone within a day or two. 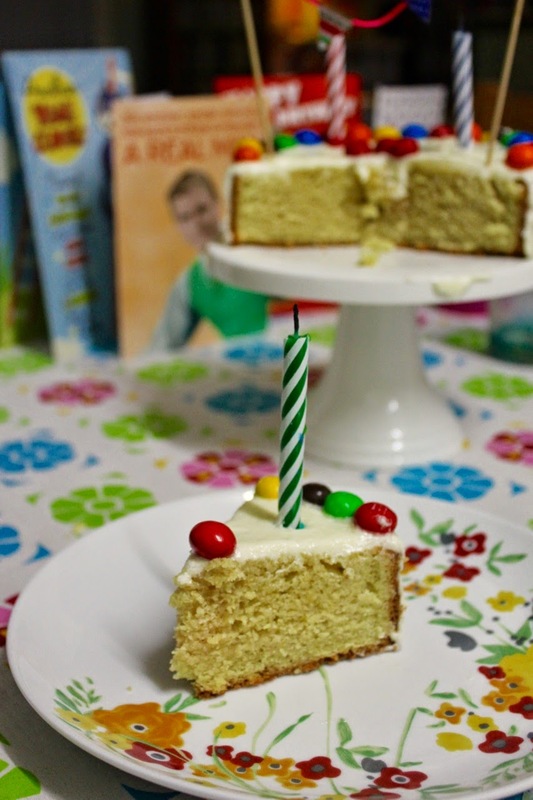 I wish it had been bigger and I could share a blogiversary celebration slice with you and all the lovely readers who have supported my blog since it started in 2007. I write a longer reflective post on the changes on my blog and my life annually at New Year's Eve so I wont dwell on these here. But I will say that I am always amazed that another year of blogging has passed and I am still here. Many thanks for continuing to visit, read and comment. Meanwhile, life seems to get busier and busier. Fortunately there is still lots of good food I am enjoying and want to share here. For instance, I had also planned to make a treacle tart as well but I ran out of time and had to postpone this for another day. We weren't fussed. Everyone was very full. Though Sylvia and E ate their cake with the ice cream that I had bought for the tart. However I have since made the treacle tart (before they ate all the ice cream) and will share it soon. Preheat oven to 180 C. Grease a 15cm round cake tin. (Or double ingredients for a 20cm round cake tin.) Mix dry ingredients in a medium mixing bowl and mix wet ingredients in a small mixing bowl. It should be thick creamy batter. Bake for 30-40 minutes or until golden brown and a skewer inserted in the middle comes out clean. Cool on a wire rack. 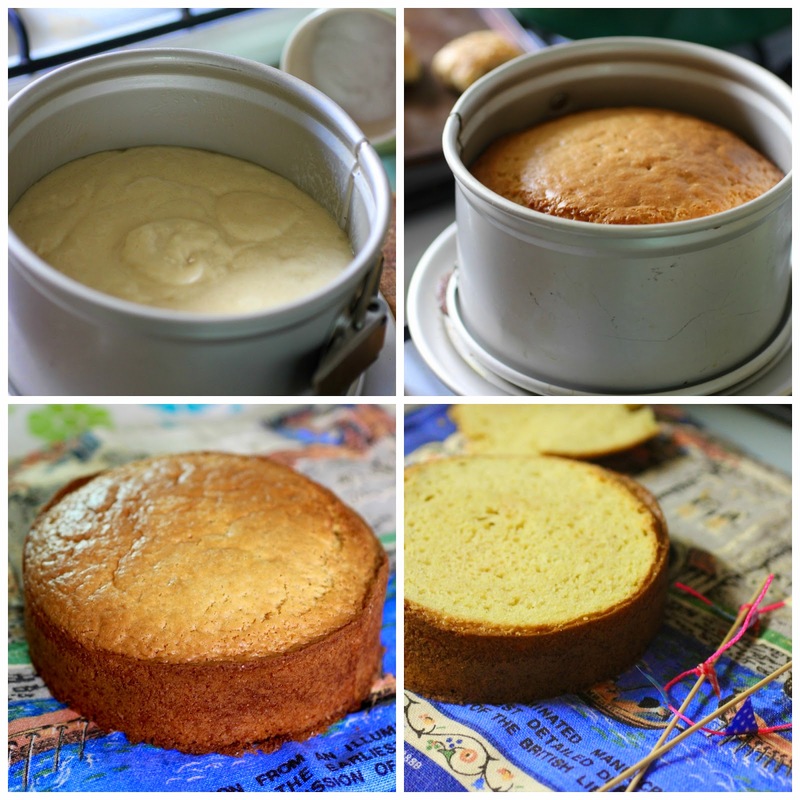 Serve dusted with icing sugar or spread with buttercream icing. Perhaps kale scones for dinner were fitting on ANZAC Day, given that after the Dawn Service, I went to my family's ANZAC Day breakfast and ate vegie fritters and tofu bacon while they had egg and bacon. I am no traditionalist in the strict sense of the word. Yet traditions still beckon me with their comforts and windows into our culture. I went to stay with my parents on Friday so I could go to the Torquay ANZAC Day Dawn Service with my family the next morning. My niece Quin was also there. She made dumplings with my mum. I was so impressed with her pleating of the wrappers. 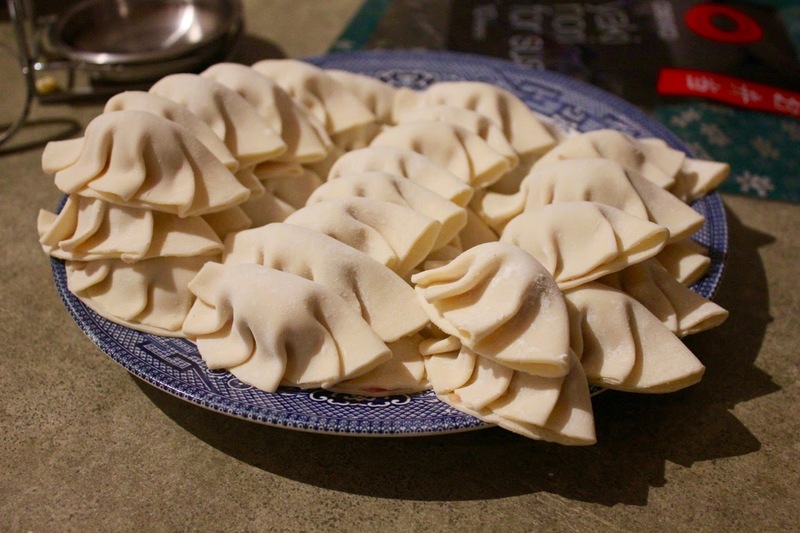 We ate the dumplings hot out of the pan before our dinner. I had vegie fritters and butterscotch self-saucing pudding. The next morning the hardy ones in the family rose at 4am so we could drive down to Torquay before dawn. This was the 100th anniversary of the day the Australian and New Zealand Army Corps (ANZACs) embarked on their first major military campaign in World War II at Gallipoli, Turkey. (See more at this post on ANZAC Day.) The service was much busier than other years. I could barely see the podium where the speeches were and had to content myself with the above photo of the No Standing sign. 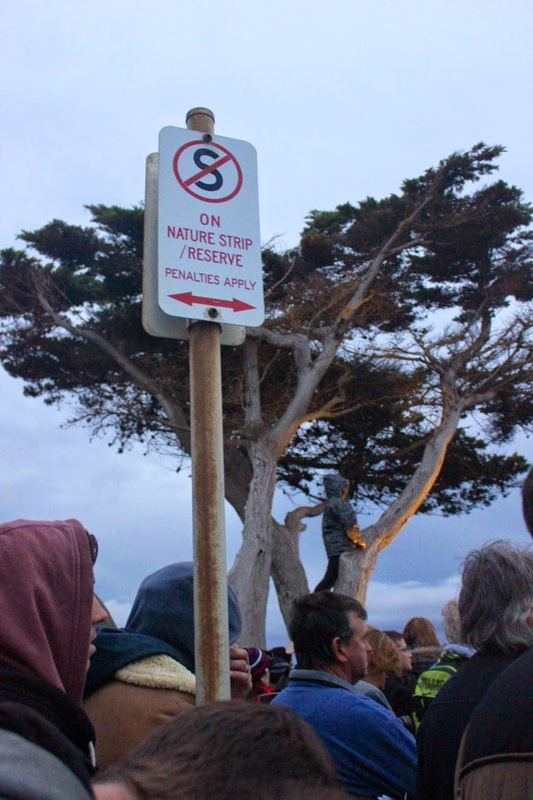 It amused me because we all did a lot of standing around while we waited for dawn, listening to stories, singing anthems, watching bi-planes fly overhead and finally the Last Post. There were also many earnest and emotional speeches. A senior soldier reminded us that the military commemorates, not celebrates, war. I did wonder if we were really managing that when the message from our Prime Minister spoke of Gallipoli as a "magnificent defeat". Indeed this reflects my mixed emotions about the way our nation remembers war. Yet when we had a minute's silence I thought of my mother's uncle who died in World War II and how many family gatherings have taken place without him since that moment. We then joined the many cars driving back to Geelong where my mum had stayed behind and cooked up a huge breakfast. 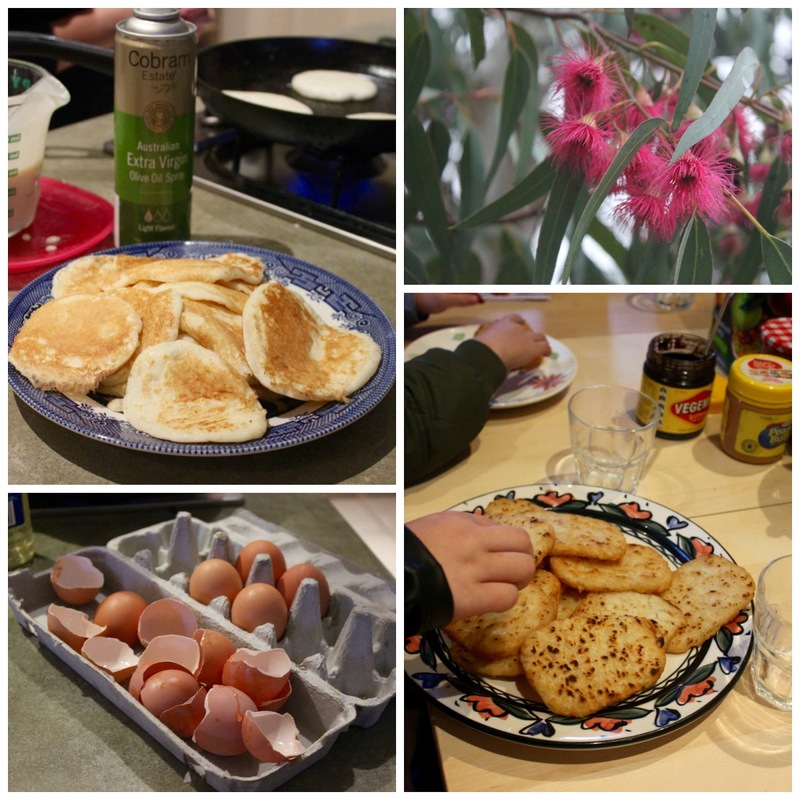 We had pancakes, sourdough bread, raisin bread, hash browns, juice and coffee. I took along tofu bacon and my mum specially made vegetable fritters for me. Everyone else enjoyed bacon and eggs as well. After breakfast Sylvia played with her little cousins and my mum and I headed out to the Newtown Farmers Market. I bought a bunch of kale. We had a light lunch (and a home made ANZAC biscuit) back at my mum's and then I drove back to Melbourne. I was so tired from my early morning that I got confused taking my 3 year old niece home and almost arrived at my 18 year old niece's home before realising my mistake. Then I had to contend with horrid rainy roads on the drive home. I had little energy for dinner when I arrived home. I had fancied making ANZAC scones but wanted something savoury. I wanted scones. I had kale. It made sense to marry them. 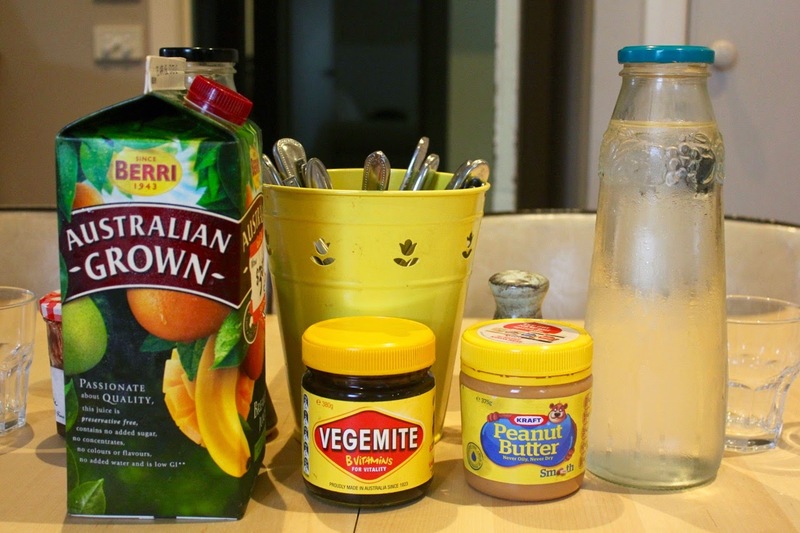 (It was like marrying traditional Australia with modern international cuisine.) I blended up the kale to make a green milk mixture. 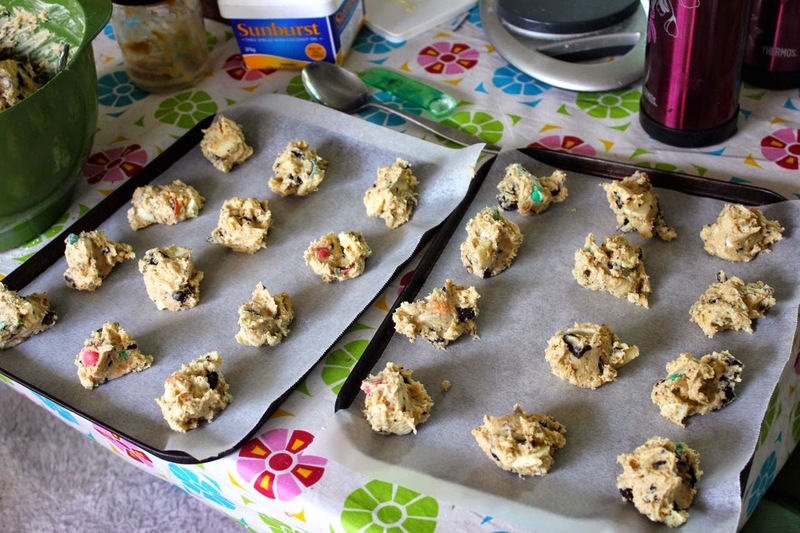 I fiddled with the seasonings in a savoury scone recipe. My scones were lovely but not perfect. More milk and a little less seasoning were needed. 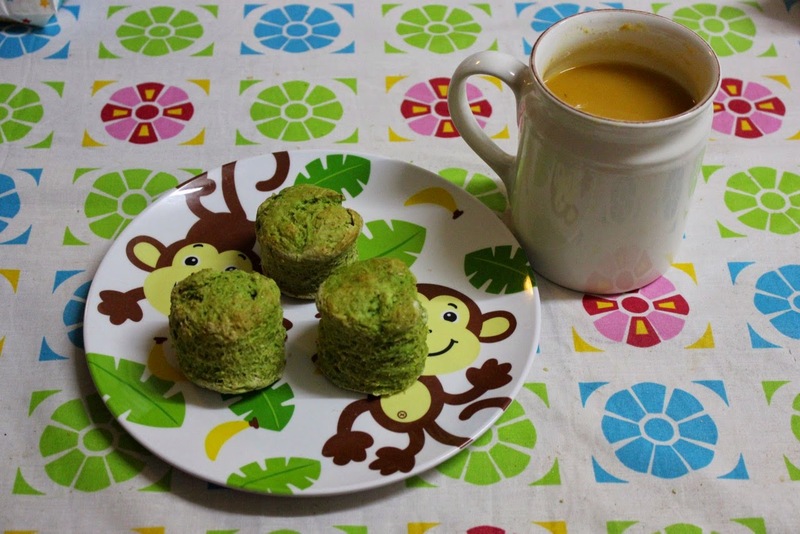 Yet there was something cheering about having green scones with my leftover sweet potato and lentil soup. I also had them for breakfast the next morning. These are the sort of hippy food that is very good with hummus and mung bean sprouts (top photo). 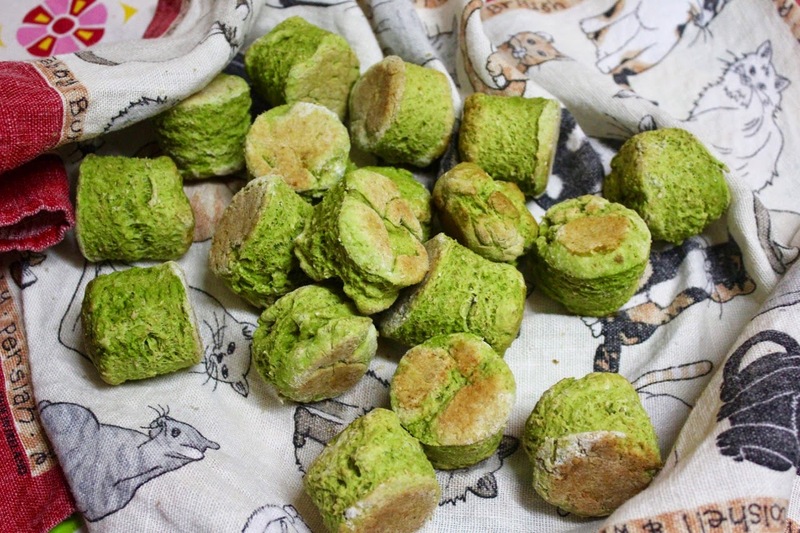 Or you can just enjoy naturally green scones because you love the colour! I am sending these scones to Elizabeth's Kitchen's Shop Local challenge because I used the kale from the farmers market. Adapted from Where's the Beef? Preheat oven to 230 C. Grease two medium oven trays. Place flour, nutritional yeast flakes, baking powder, mustard powder, smoked paprika, garlic powder, onion powder and salt. Rub margarine into dry ingredients. Mix in chives (if you have them). Add kale and milk mixture to mix into a dough. Knead briefly on a lightly floured surface until smooth. Pat out to about 1.5 cm and cut into round or whatever shape you fancy. Place on greased tray about 1 cm apart. 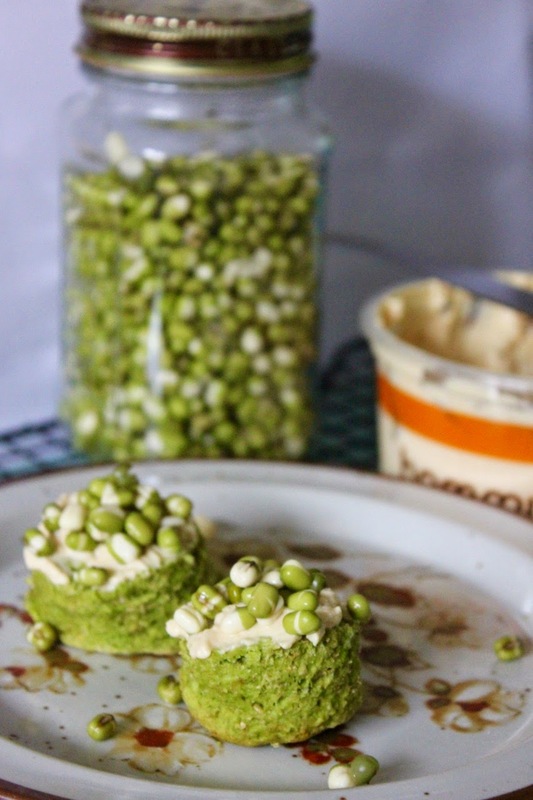 If there is a little extra green milk that has pooled at the bottom of the blender, use it to brush on the scones (or use a little extra milk). Bake for 15 minutes or until slightly browned on top. Remove from over and wrap in a clean tea towel until ready to eat. Best eaten on day of baking but still edible the next day. NOTES: I would use perhaps another 1/4 cup of soy milk to make the dough softer. If it was sticky I would knead with a little flour if required. I used a mixture of white and wholemeal flour. I used 1/2 tsp of onion salt instead of 1/2 tsp onion powder and pinch of salt. I also substituted smoked paprika for some of the mustard powder. The scones were a bit too savoury. I have adjusted the onion powder in the recipe but would possibly reduce the amounts of nutritional yeast and smoked paprika. I didn't use the chives but would use them if I had them as well. A little lemon juice or apple cider vinegar to sour the milk might also lift the flavour. We were short on time for dinner. I took out a tub of rice from the freezer. Only, when I opened the lid after defrosting, I found it was the stewed peaches I had earmarked for Kari's Raw Apple Cheesecake Pudding. Which means it was time to make the cheesecake. The peaches just wouldn't wait any longer. The peaches were stewed towards the end of summer and I had tired of them. When I saw Kari post her cheesecake pudding, I decided to make it with the peaches. But the kitchen was busy with holiday and birthday baking. So I put the peaches away for a day when we weren't inundated by treats. It was easy to make and delicious to eat. As I am a bit wary of coconut oil, I just added dessicated coconut for instead of oil. My high speed blender made a very smooth mixture of the ingredients. Kari preferred a bit of texture which might be why her mixture seems firmer than mine. Or it might be that she added raw apple rather than stewed peaches. I added some nutritional yeast flakes and salt for that slightly savoury taste of cheesecake. It was mostly fruity and creamy but very pleasing. As Kari noted, it wasn't a set cheesecake so she called it a pudding. 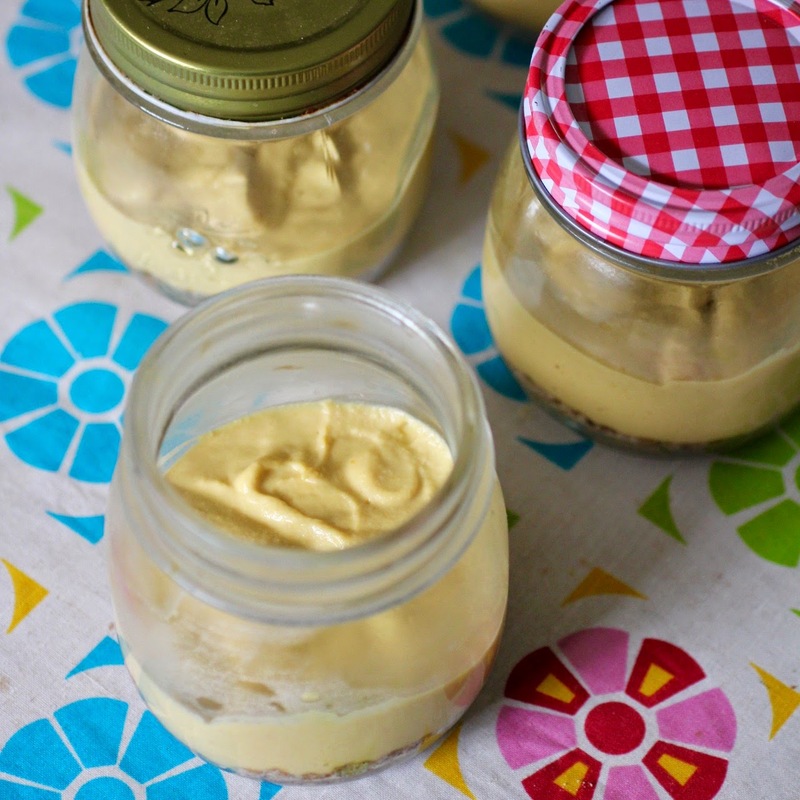 I am happy to call it a cheesecake but enjoyed serving it in jars. Sadly I didn't have cute little jars like Kari. Hers was a raw cheesecake but as my peaches were stewed it wasn't raw. Perhaps I will try it with raw fruit another time. Serendipitously as I made these I was listening to a woman on the radio talking about World Allergy Day (17 April). They talked a lot about hayfever. However I thought it relevant as these are dairy free, egg free, and soy free. There are so many allergies out there. They are not nut free but for those like my daughter who can't eat peanuts but can eat other nuts, they are fine. I ate them mostly for breakfast. 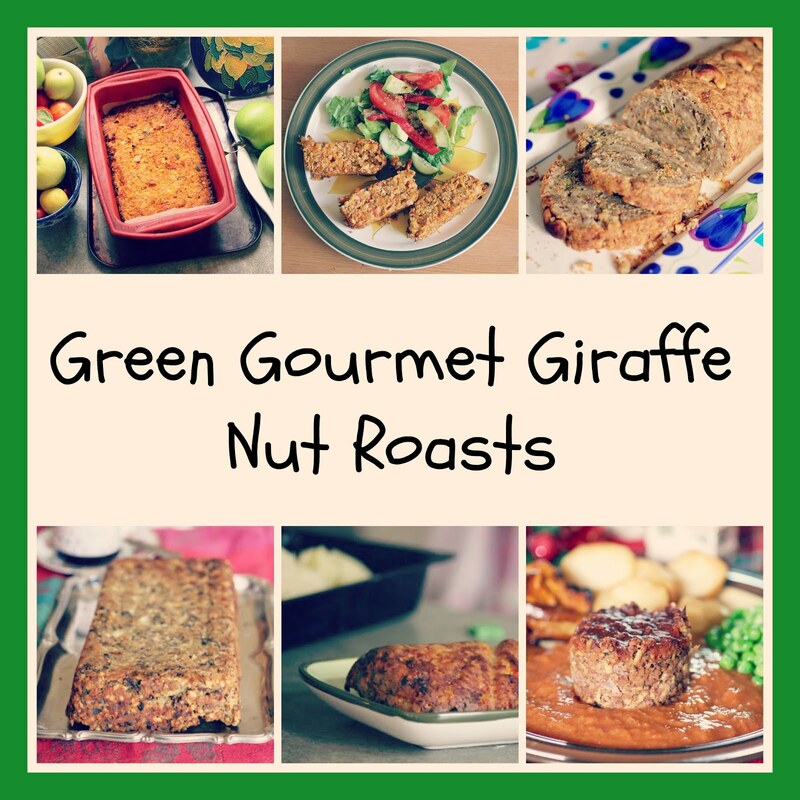 They are quite nutrient-dense with all the nuts and dates but they were very satisfying. Of course, they would also make a great dessert. Lastly if you read Kari's post, you will see that she posted this cheesecake recipe as part of her London Marathon fundraising effort. 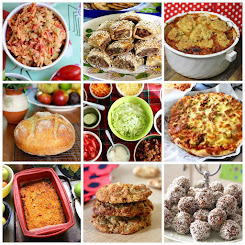 She has posted lots of great recipes as part of her fundraising for Beat, a UK eating disorder charity. On Sundahy she runs her marathon. I wish her best of luck and encourage you to make a donation if you are able to. And I hope she has some good food like this cheesecake afterwards! Four years ago: Why Does Food History Matter? 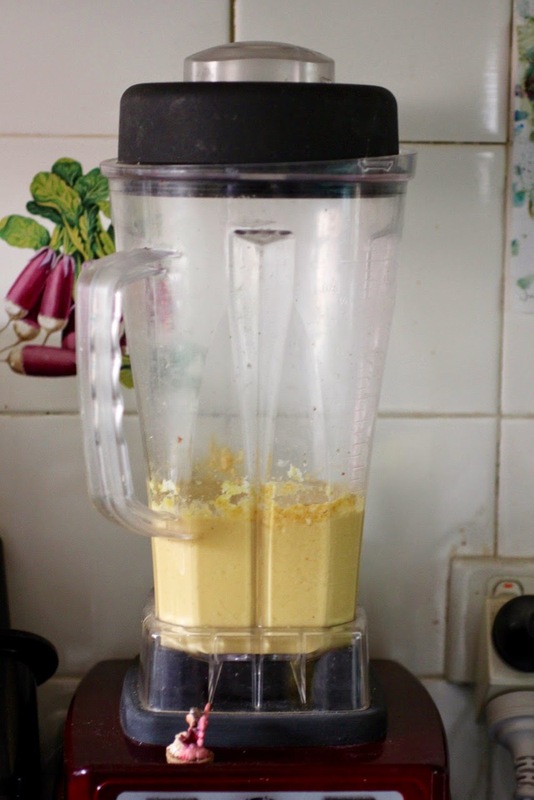 Make the base by blending all ingredients in blender or food processor until it can clump together. 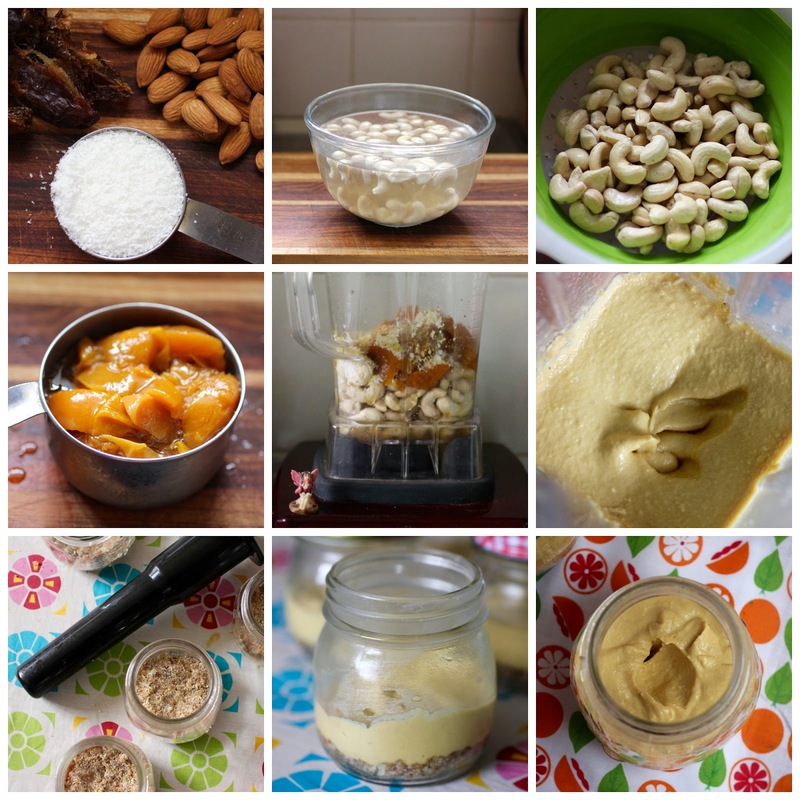 Press into 4 to 6 small jars or glasses. (I used the tamper from my blender.) To make the filling, blend all ingredients until smooth. (A little bit of texture is fine.) Divide among glasses or jars (and screw lid on if there is one). Chill in the fridge. Keeps refridgerated for 5 days or can be frozen to keep longer. NOTES: My stewed peaches were not terribly sweet. I made them months ago and could not remember what they had in them by the time I got them out of the freezer - I think they had brown sugar and lemon juice. When I was a student, we had a Japanese student stay with us briefly. She cooked us lots of amazing meals. It was my first experience of how interesting Japanese food could be. Often Japanese restaurants have not seemed as good as her dishes. Junko never made me Japanese curry but it is one of the more pleasing Japanese dishes I have had in restaurants. So I was keen to try it at home. Sometimes it is only in making it myself that I understand a dish. Indeed understanding how Japanese curries differ from others I have had came from making it. 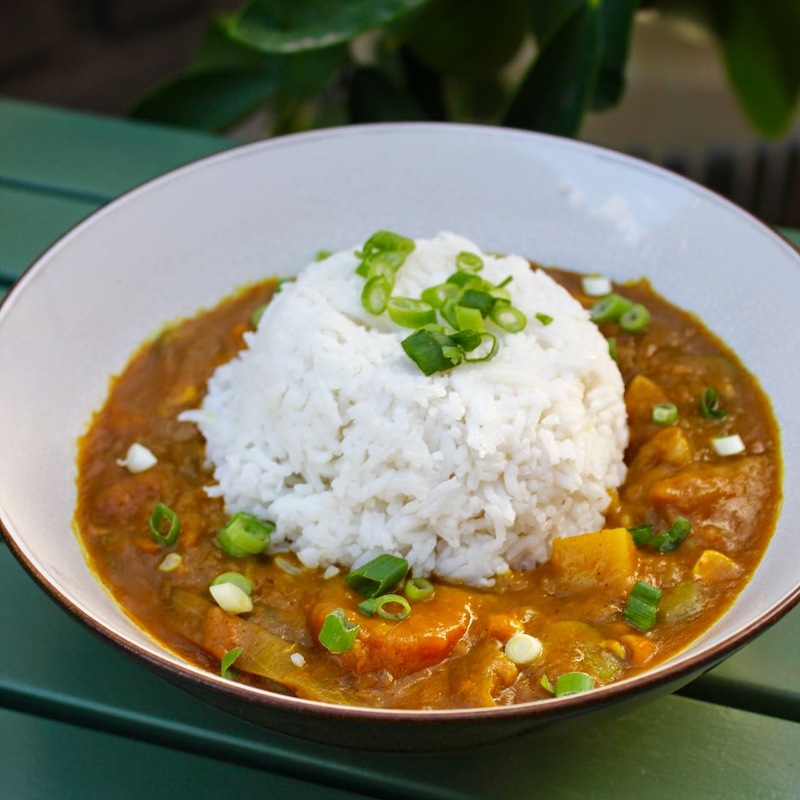 It is more like an Indian curry than a Thai curry but is made like a soup with a lot of the flavour and texture coming from stirring in a roux. I followed the recipe by Rika of Vegan Miam. She has such lovely photos that draw me in. Then, the geek in me wanted to check if her recipe was typical. So I did a quick search for other Japanese curry recipes. I was surprised to read that many people just buy the roux rather than making it. I was happy to do as Rika did and make it myself. 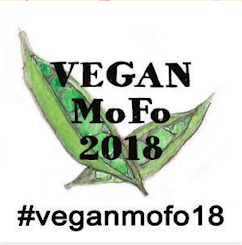 I was interested that recipes for Japanese curries suggested different flavourings to add including Worcestershire sauce, red wine, apricot jam, miso, maple syrup, ketchup, honey and chocolate. I would like to try it with chocolate one day. This curry had some apricot jam that was on hand. More mysterious was the Oriental curry powder that Rika used. 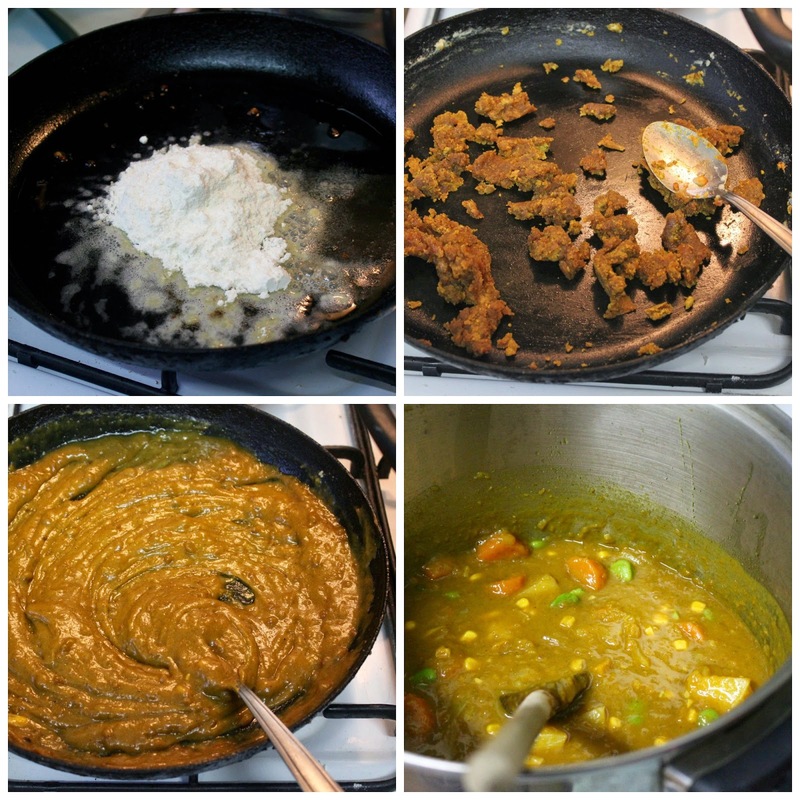 I have never heard of it and just used the Keen's curry powder that I had in the cupboard. Our curry was quite hot, though not unpleasantly so. 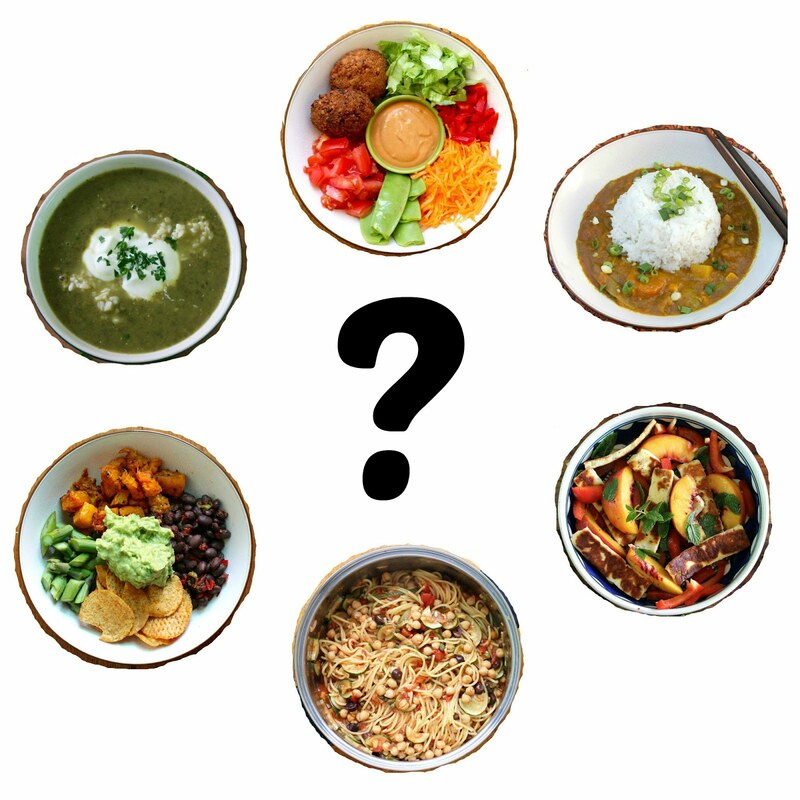 A few people noted that Japanese curries are quite mild. So I checked for Oriental curry powder in the supermarket and only found a roux for a Japanese curry. But as it had palm oil and MSG I don't know that I will be rushing out to buy it. We ate this on the school holidays. It was a chaotic night after a trip to the park with Sylvia's school friends. I searched high and low for black sesame seeds but they were nowhere to be found. I discovered them in the back of the cupboard last night. Maybe it is a sign that I need to make Japanese curry again. Vanesther of Bangers and Mash for The Spice Trail. 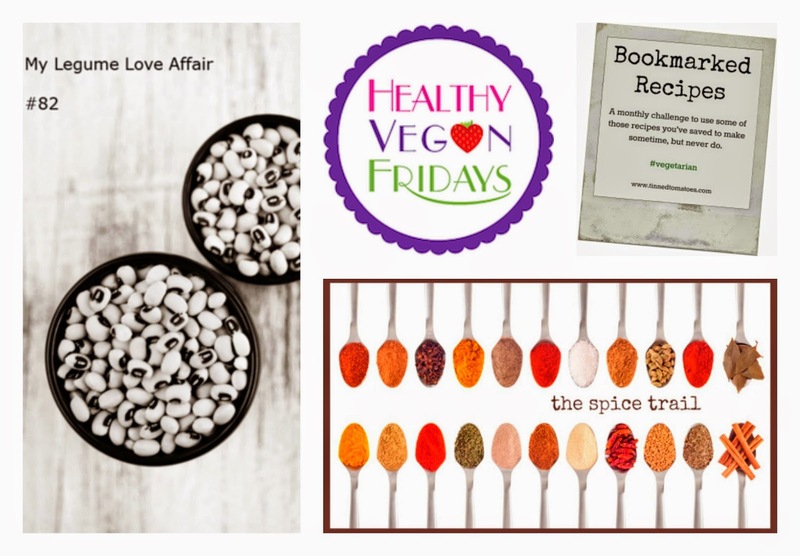 This month the theme is favourite spice mixes. 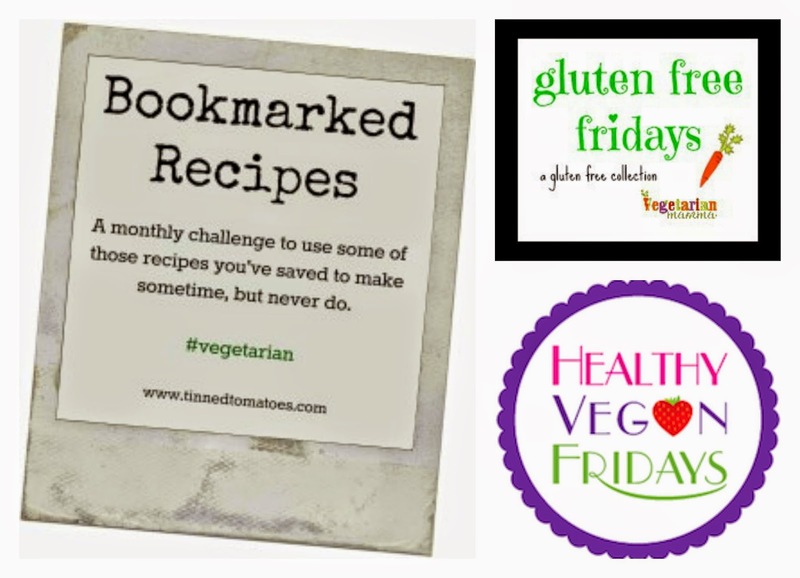 Kimmy of Rock My Vegan Socks for Healthy Vegan Fridays #43. Simona of Briciole for My Legume Love Affair #82 which is coordinated by Lisa's Kitchen. Jac of Tinned Tomatoes for Bookmarked Recipes. Carole's Chatter for Curry on Friday. Heat oil in a stockpot or large saucepan. Cook onion and carrots for 5 to 10 minutes until vegetables soften. 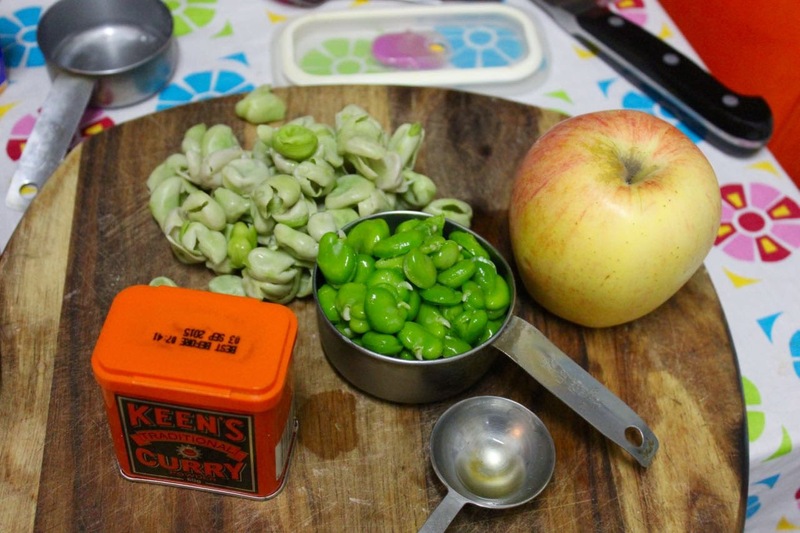 Stir the garlic in for a minute and then add remaining ingredients except broad beans. Bring to the boil and simmer for about 10 to 15 minutes or until vegetables are tender. Meanwhile make the roux. Stir together the curry powder, tomato sauce, Worcestershire sauce, and apricot jam and set aside. Fry together the oil and flour until it slightly browns and smells cooked. Add the curry powder mixture and stir until smooth. Add a ladleful or two of liquid from the curry and stir roux until smooth. 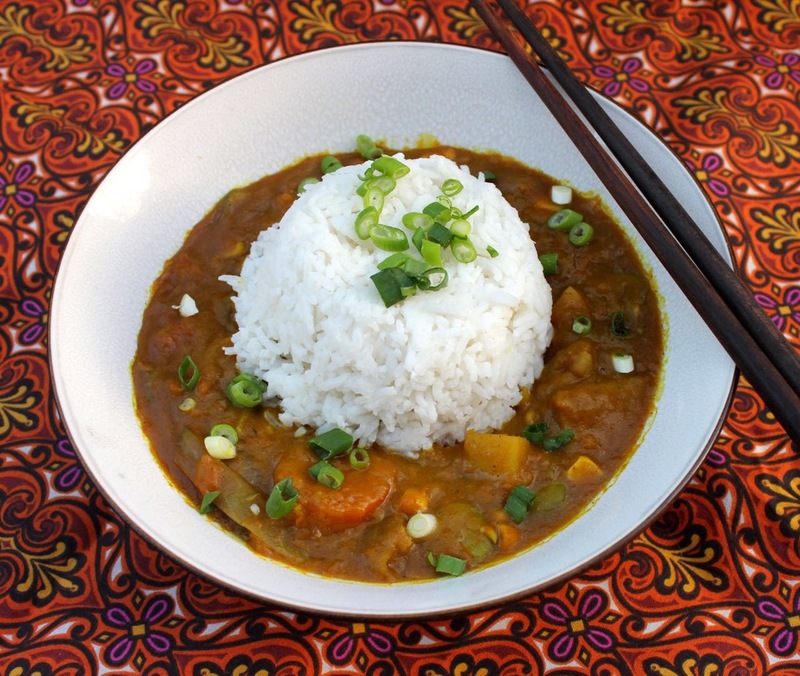 NOTES: For traditional curry, use a Japanese Oriental curry powder (such as S and B). I used Keens curry powder which is more Indian. It worked well but was quite spicy with 1 tbsp of curry powder in the roux. Perhaps less curry powder is needed with Keens, hence my suggestion of between 1 to 3 tsp depending on the curry powder used. 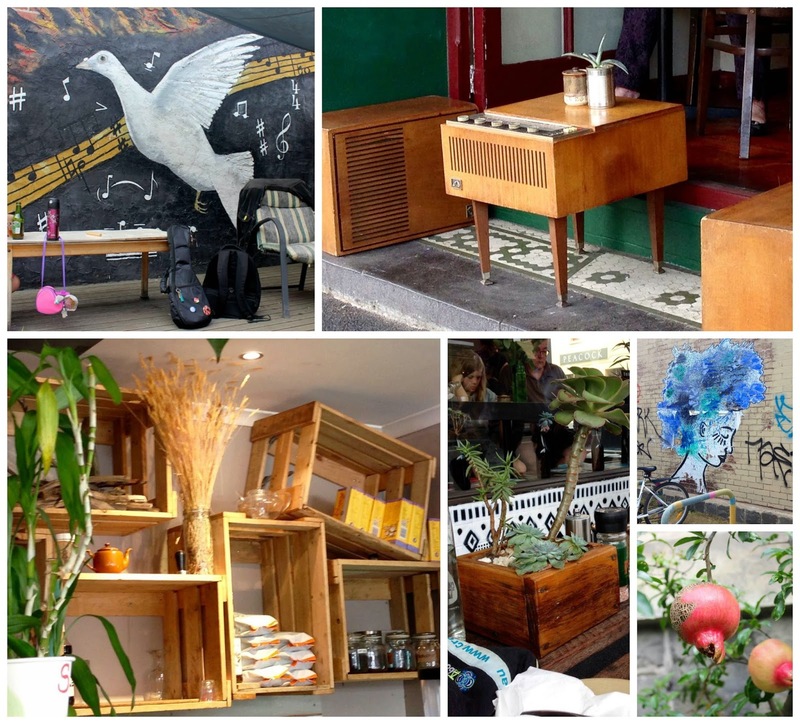 It was the old record player re-purposed as a cafe table that first caught my attention as I walked past Ruckers Hill Cafe. 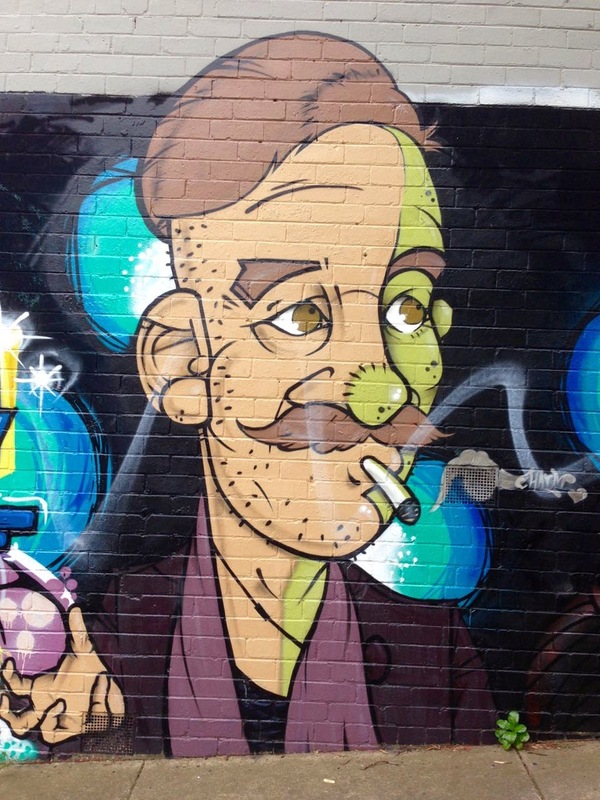 We had just had a nightmare finding parking in Northcote. If there was a parking spot we missed it and then it was gone when we returned, or someone took it from under our nose. Finally we rushed down Northcote High Street to meet E who was volunteering at the Ukelele Festival. 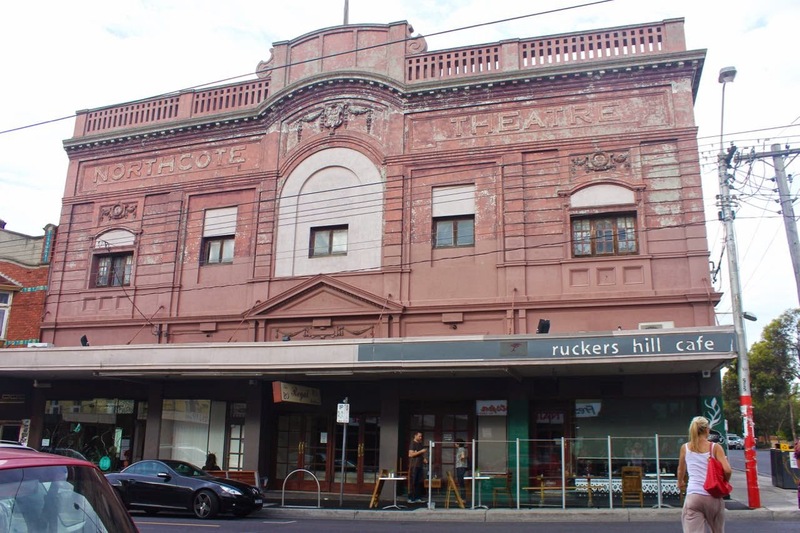 I suggested we backtrack to Ruckers Hill Cafe and was very glad I did. It is not a huge cafe. There wasn't much room inside so we saw on a bench outside. 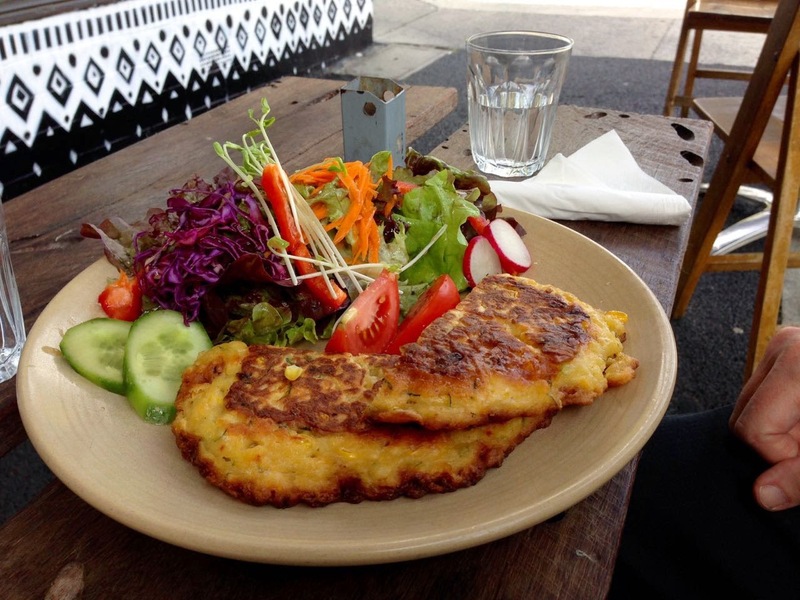 We ordered Zucchini and Carrot Fritters for E (above) and Olive Cream Cheese Slice for me (below) and Cheese Toastie for Sylvia (not pictured). In keeping with the ambiance of the cafe, everything was presented beautifully with lots of colourful and healthy vegetables. I am not usually a fan of these eggy slices but was delighted with this one that had interesting add-ins, lots of flavour and a generous pile of salad on the side. While the salad had a lot of lettuce, it had a great dressing that made me happy to eat my way through it. My slice had big blobs of mild cream cheese in it which were well balanced by the olives. It was a great place to sit. We saw lots of fellow ukelele players as we watched the passers-by. Some stopped to chat. Others gave us a big smile and an entertaining remark as they rushed by. The waitress was friendly as we talked to her about the Studio Ghibli films. I even liked that we could go in and look at the old piano as we waited. If we had had more time we might have stayed for dessert and one of the interesting juices. 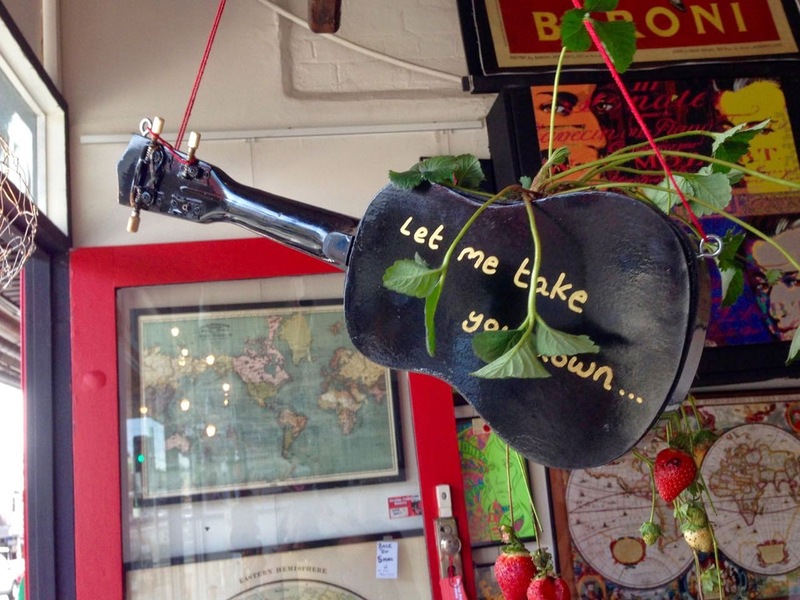 We had a ukelele performance to go to and then found ourselves at Yuni's Kitchen for a drink. Actually E and Sylvia had a drink and I had a wander around the shops. Before I went I checked out the menu and we agreed we should return to eat there some day. Yuni's Kitchen has a lovely courtyard with a painting of a dove one one side and the Chalice Church on the other. 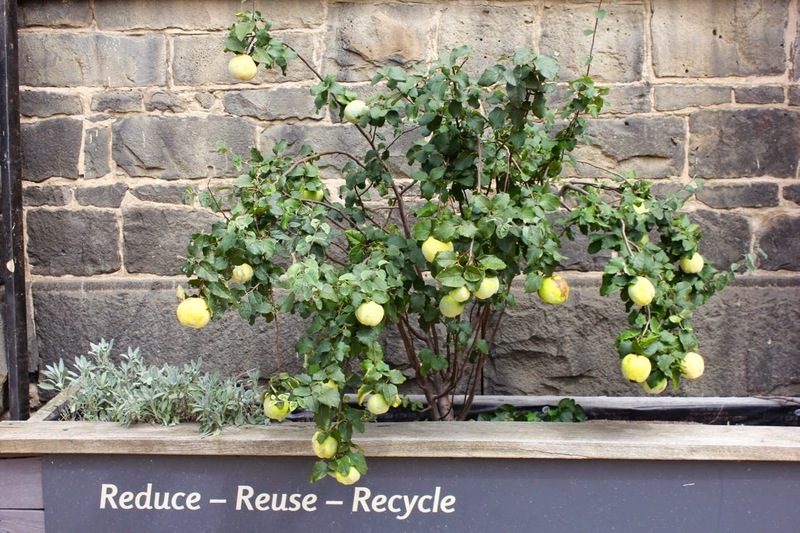 I was fascinated by the quinces and pomegranates growing at the side of the church. Are they for passers-by or does the church or the cafe use them? Whatever their purpose it added a really nice touch to a leafy courtyard with shade cloth and lots of space for kids to run around. 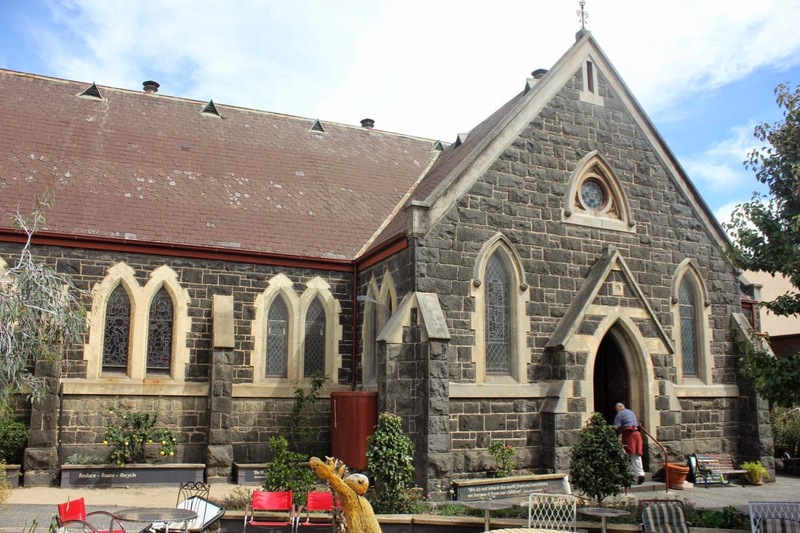 We could also hear the faint sounds of ukelele performances in the church. We then went to see E play at the Shellac Gallery. It was great to see him playing solo and to hear him performs songs I have heard him practicing in the bedroom. And I had a catch up with my friend Heather. 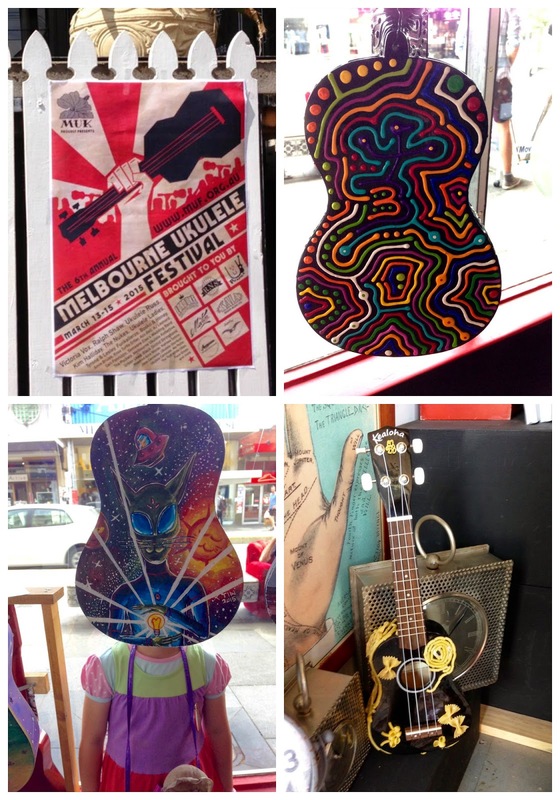 While at the Shellac Gallery we were also able to check out the ukelele artwork. 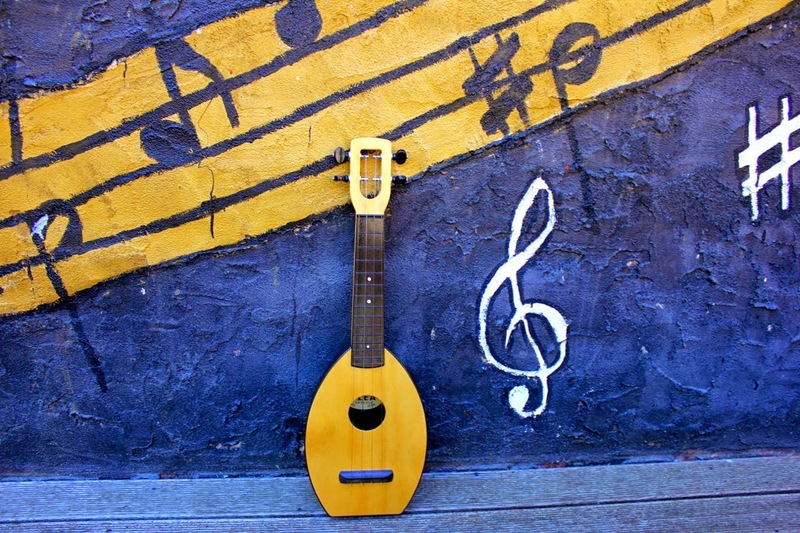 I really liked the above black and yellow ukelele which was decorated with pasta. Then we had promised Sylvia some time browsing the beautiful toys in the Big Dreams shop. By then I was ready to go home. E stayed on for more gigs but I was so tired that I took Sylvia to buy some chips from the Fish and Chip shop (Abdul's Halal Takeaway) on Elizabeth Street, Preston to take home for dinner. Luckily the staff were kind and honest. I absent-mindedly left both my purse and Sylvia's dolly behind as we left but someone came out to let us know. Then we collapsed at home with excellent hot chips and corn jacks. 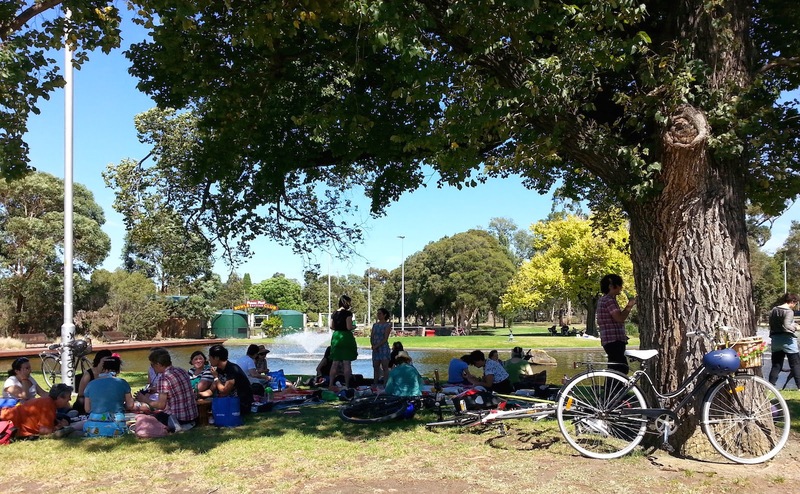 Isn't it great when the weather is warm and you spend the afternoon in the park under a large shady tree with a crowd of bloggers and heaps of good food! 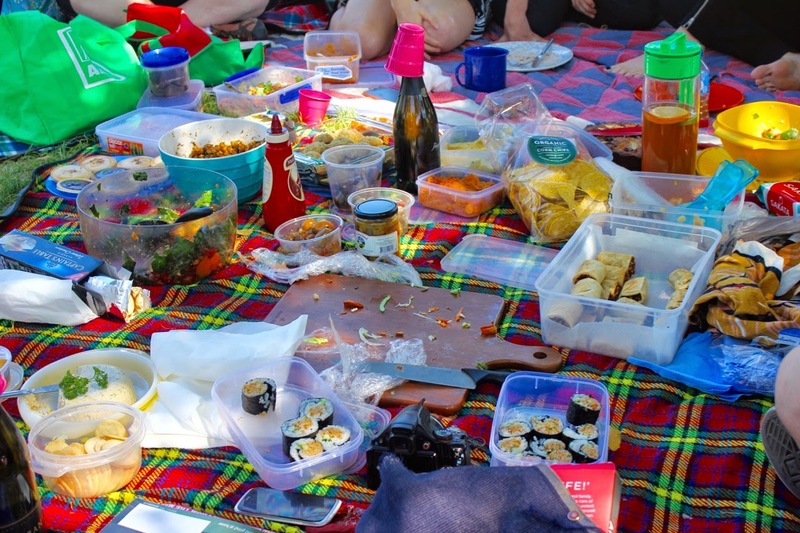 In March, two of my favourite bloggers, Cindy and Michael of Where's the Beef, had invited us along to a potluck picnic to celebrate their 2000th post. I took along some vegan salmon sushi and zucchini brownie topped with coconut bacon. We make sushi quite often in our house. Sylvia loves it but does not like any filling other than sushi rice. I decided it would be a good savoury dish to take to the picnic. I could make some plain for Sylvia and experiment with some vegan salmon filling for those what wanted something different. And bloggers love trying a new dish. Salmon is often offered as a filling in the little sushi shops in food halls. I was never keen on fish and seafood. In particular, I have disliked the idea of eating salmon ever since a friend had food poisoning from it when I was a university student. Yet I do love its brilliant orange colour. So please don't ask me if the pate compares to salmon. I have no idea. It wasn't quite as brilliantly orange as I had hoped but was rather pleasing nevertheless. And it tasted very good in that nutty, carroty, dilly way. I made the brownie the night before. 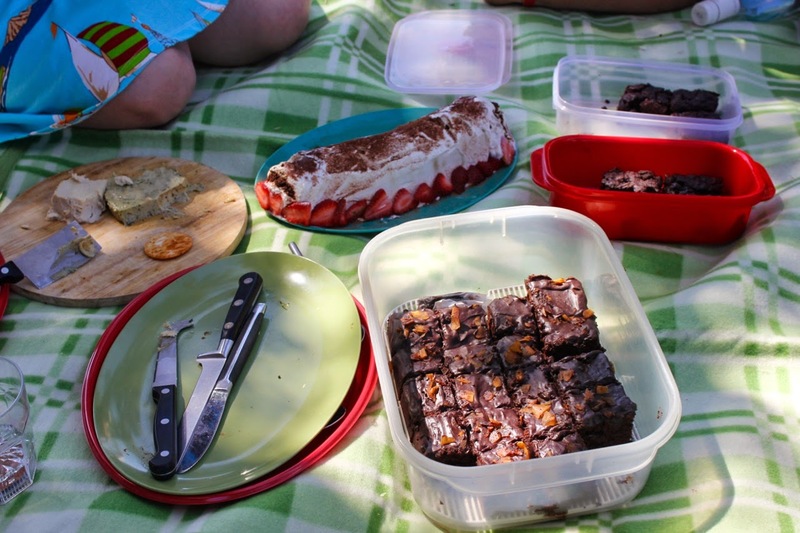 On the day of the picnic I made the ganache, the pate and the sushi. By the time we arrived the party was in full swing. I didn't take lots of photos because I was busy eating and chatting with other bloggers. Fortunately E took the above photo of the picnic so you can see what a lovely location it was. Dessert was every bit as splendid a spread. I couldn't resist tasting a vegan chocolate ripple cake made with coconut cream (pictured above). I also loved the chocolate caramel slice and some bounty bites. Linda and daughter brought some lovely choc chip muffins and Rosalie brought some of her brownie that I regretted not trying. It was great to taste Faye's Greek no-honey walnut cakes (‘Melomakarona’) - they are really delicious. I didn't take great notes so I am sure I have left out other delicious dishes. You can see more photos at Faye's Veganopoulous blog. Yes it was all very intense and decadent. 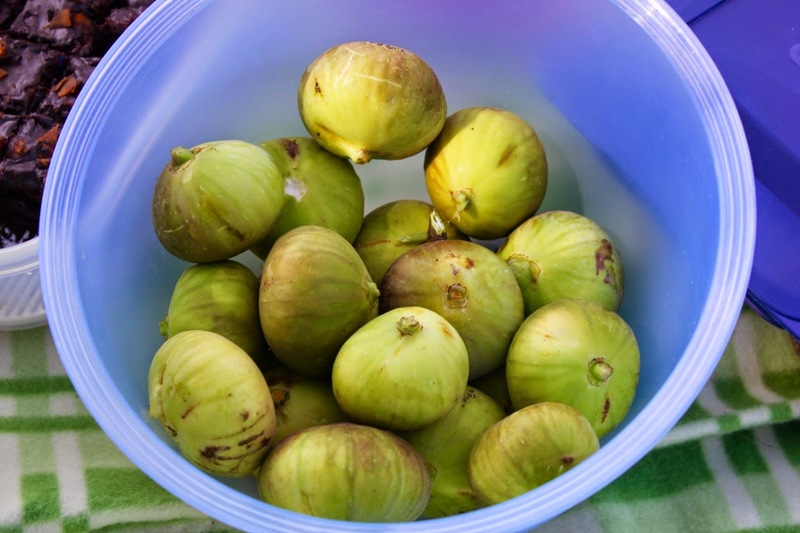 Fortunately Ivan brought along some fresh figs from the backyard. And it was hard to focus on the food when catching up with old friends and meeting some bloggers for the first time. We talked about chickpea brine meringues, facebook vegan groups, vegans in the airforce, worm farms, and the supreme master at Loving Hut. I am always a little wary of going along to these bloggers potlucks. But despite some nerves about if I will know anyone, I always find it is great to meet up with online friends and that everyone is very friendly. I went home with some figs as well as some leftovers of Faye's dill cheese and walnut biscuits. 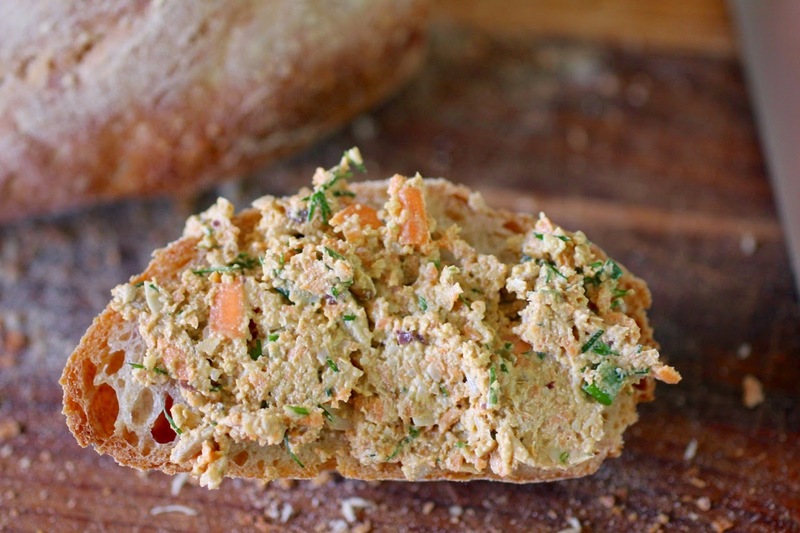 We still had more vegan salmon pate in the fridge that taste very nice on fresh bread. Cindy at Gluten Free Mama for Gluten Free Fridays #138. Roughly blend drained sunflower seeds, walnuts and 3/4 of the carrots in a blender or food processor*. Add vinegar, lemon juice, tamari, dulse flakes and salt. Blend until smooth. Add spring onion, dill and remaining 1/4 cup of carrots. Pulse until these are roughly chopped and combined. *NOTES: The sunflower seeds can be soaked while you gather and chop ingredients for the recipe. The recipe I used said 1 scant cup of carrots but I used a heaped cup. I used my high speed blender which was ok but needed a bit of prodding. A good food processor would probably work better. 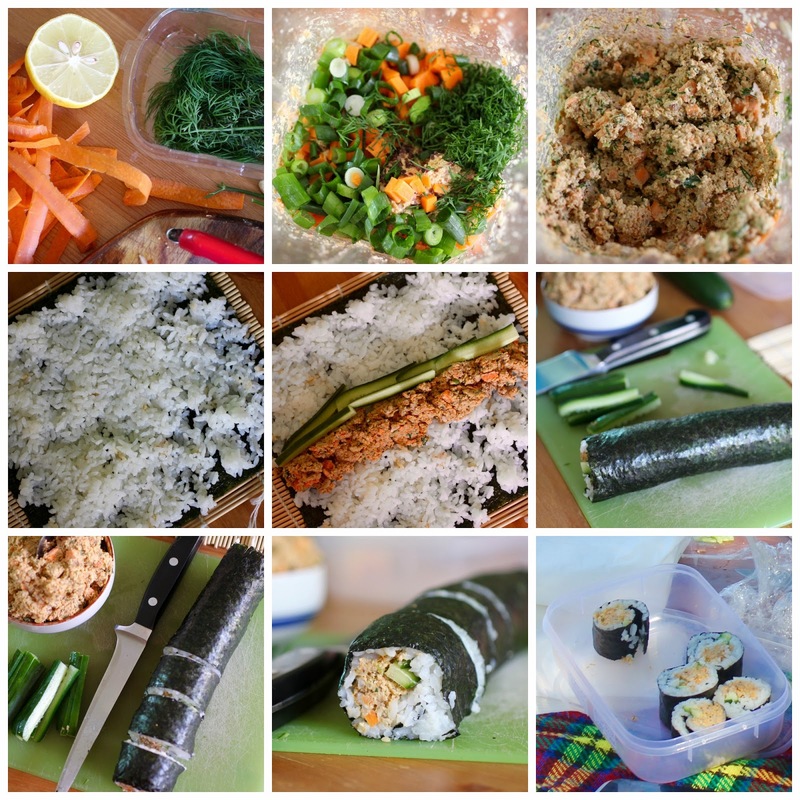 To make vegan salmon sushi, I simmer 1 cup of sushi rice and 1 1/2 cups water for 20 minutes with lid on and no stirring. 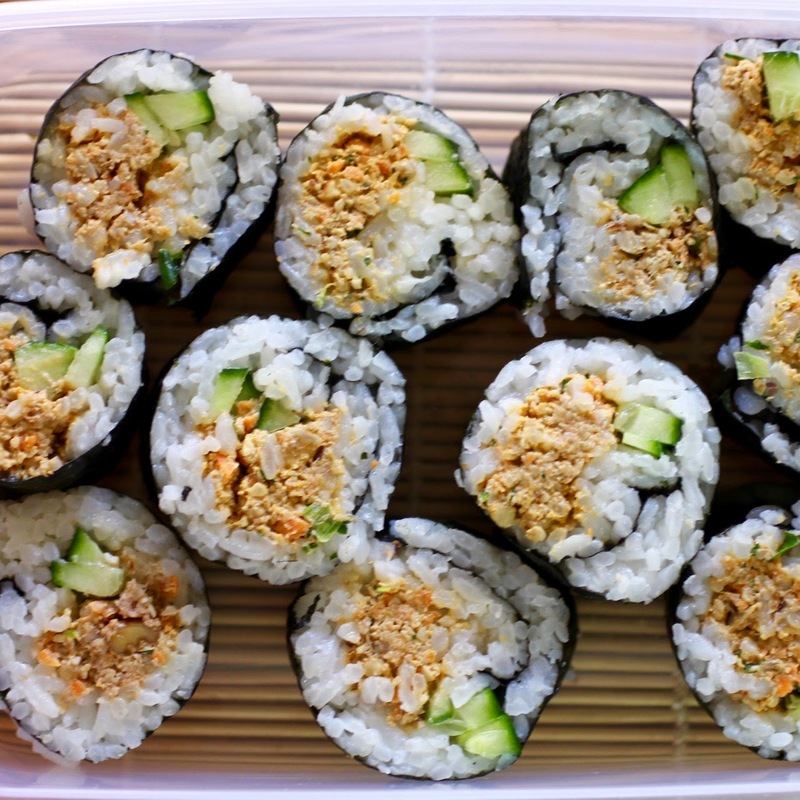 I stir sushi seasoning into the hot cooked rice, cool it and then spread it on sheets of nori. 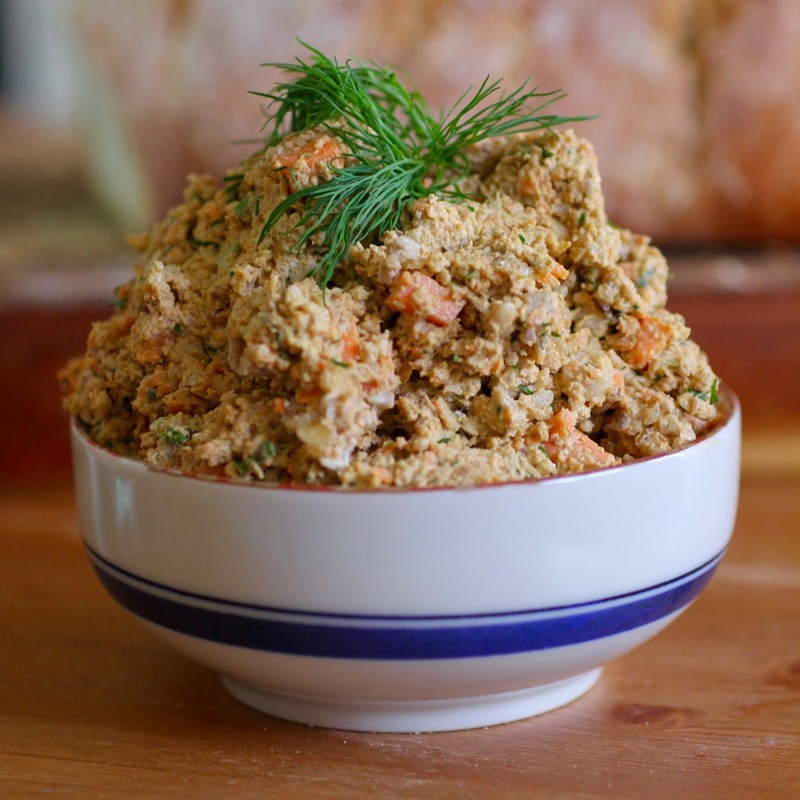 Spread salmon pate in the middle with some cucumber sticks. Roll up and slice with a sharp knife. After Easter lunch my mum sorted out the leftovers and told me she was throwing out the remains of the filling she made for the caramel tart. I couldn't bear to see the luscious creamy dreamy caramel go to waste so I volunteered to take it. Then, like my mum, I wondered what on earth I would do with it. 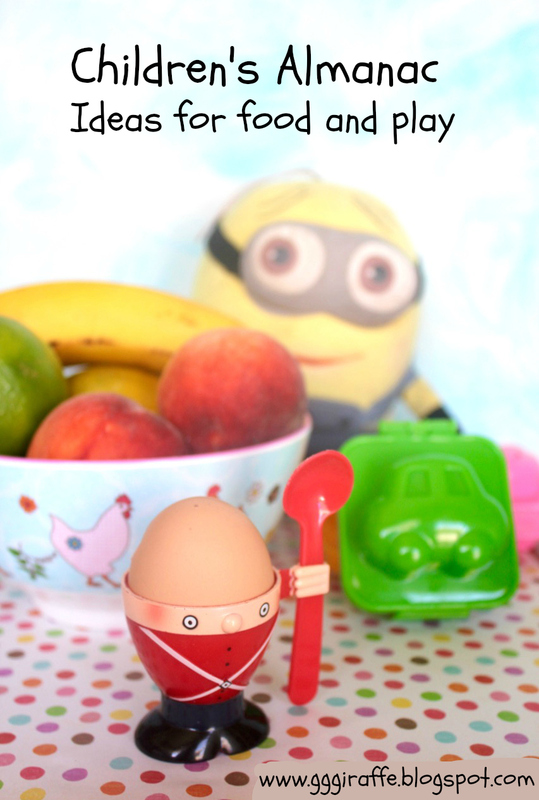 We have had enough chocolate and hot cross buns over Easter. Decadent caramel chocolate concoction seemed just too much. 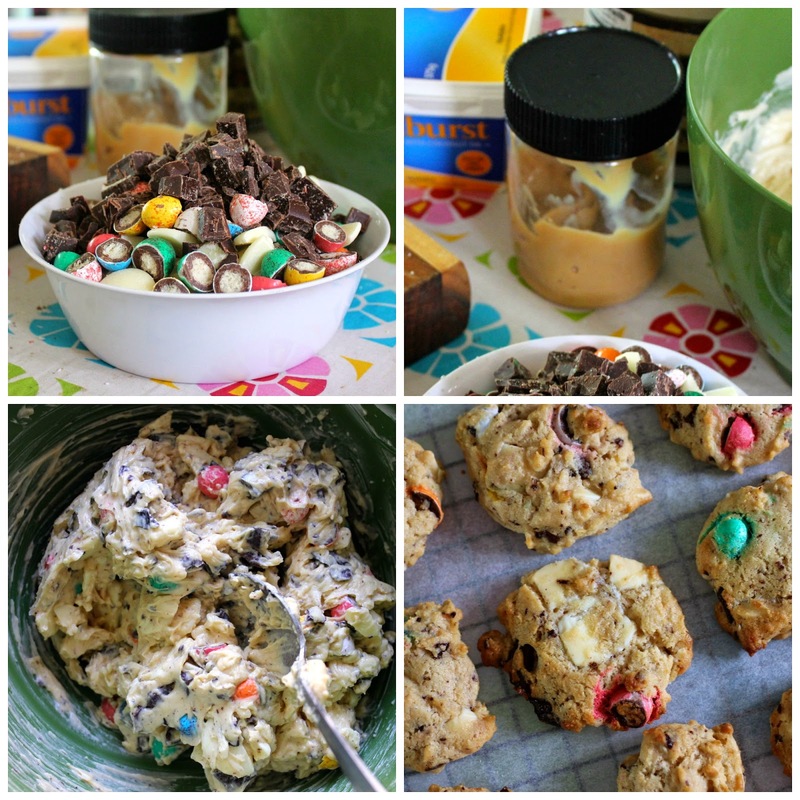 But perhaps a few choc chip cookies to use up Easter eggs would be alright. 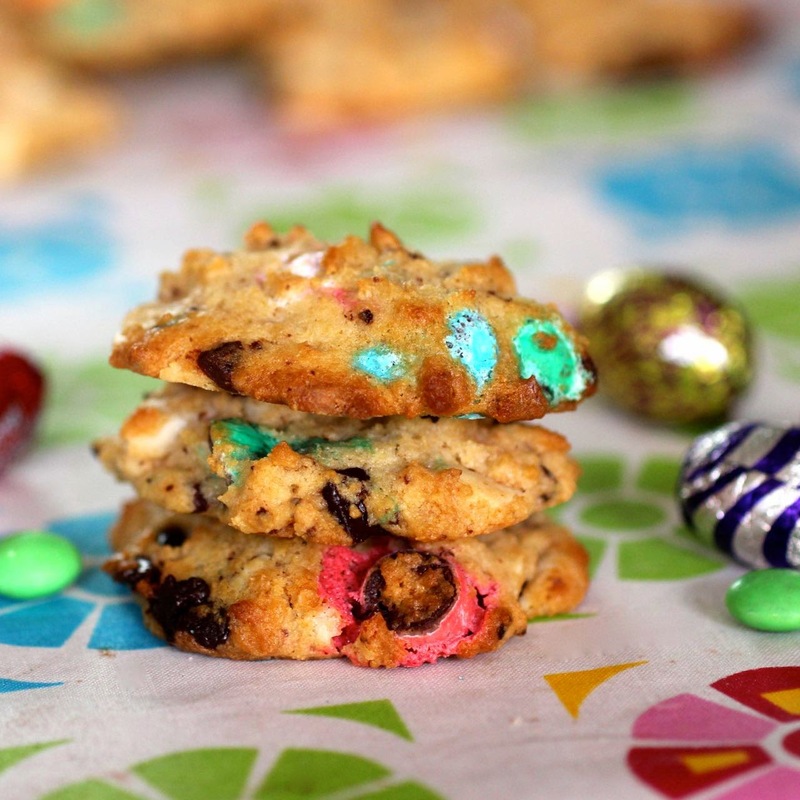 The biscuits were not as indulgent as last year's leftover chocolate easter egg slice. However I confess that yet again, I stashed away some eggs especially (eggspecially) for baking. 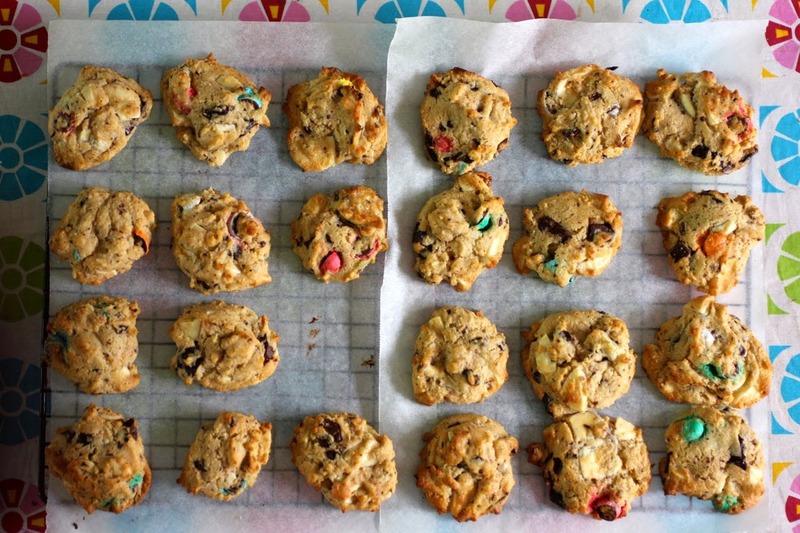 There is something so much more fun about baking with colourful chocolate. Even better, when I started to chop up the little M and M easter eggs, I found they had crispy insides. 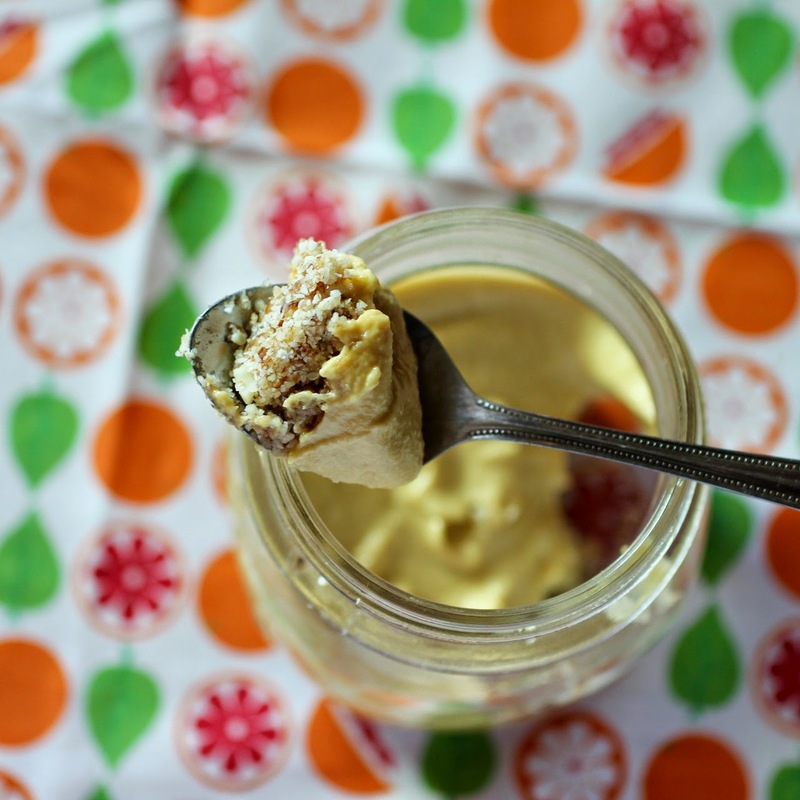 I looked around at choc chip cookie recipes and ideas for adding dulce de leche. Most recipes are for biscuits stuffed with dulce de leche in the middle but I really liked the recipe at Mind Over Batter that mixed it into the batter for extra flavour. 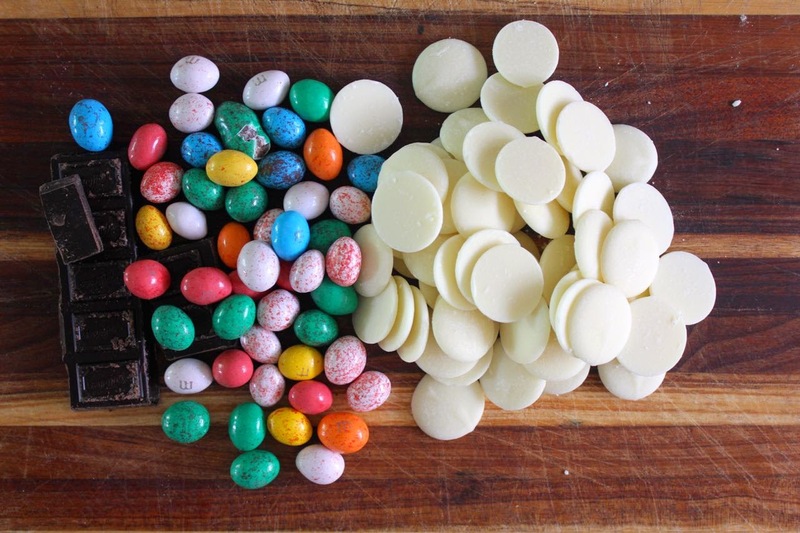 I had so many white chocolate melts leftover from the Easter egg chicks that I was generous with the salt in an effort to avoid them being overwhelmingly sweet. I used a favourite condensed milk choc chip cookies recipe that I have often made with leftover condensed milk. It was easy, eggless and smelled amazing while the biscuits were baking. As mentioned at the top of the post, we have feasted on enough Easter chocolate and hot cross buns to last us a lifetime. 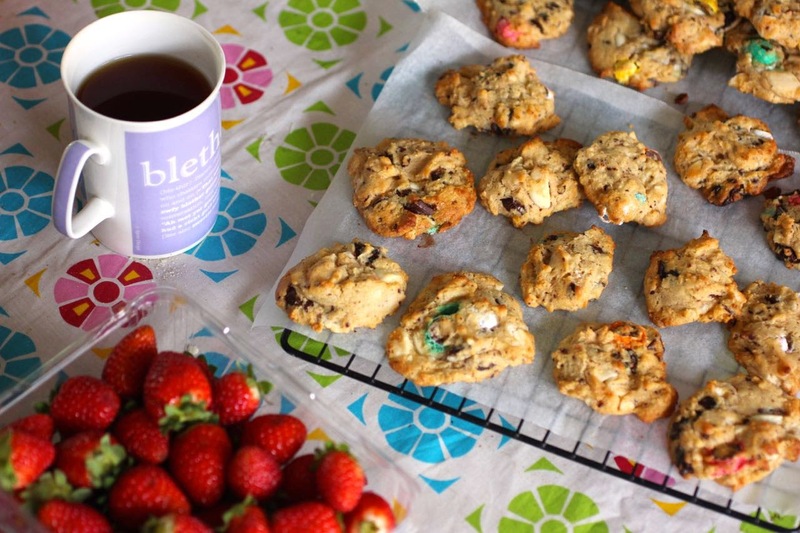 Most of these cookies went straight into the freezer to be eaten occasionally when we need a sweet snack. They last so much longer that way. 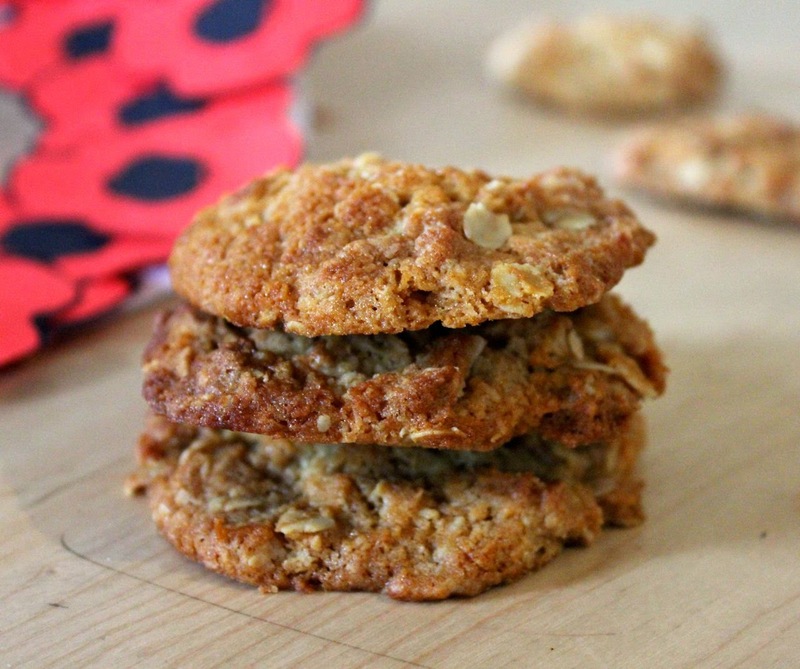 The other reason I wanted to bake these biscuits is that I thought they would be good for the school lunchbox. Sylvia has delighted in hoarding a little stash of Easter eggs that she received. Yet when I put a cookie in her lunch box on the first day of school term yesterday she told me told me she would much prefer ANZAC biscuits. Kids! 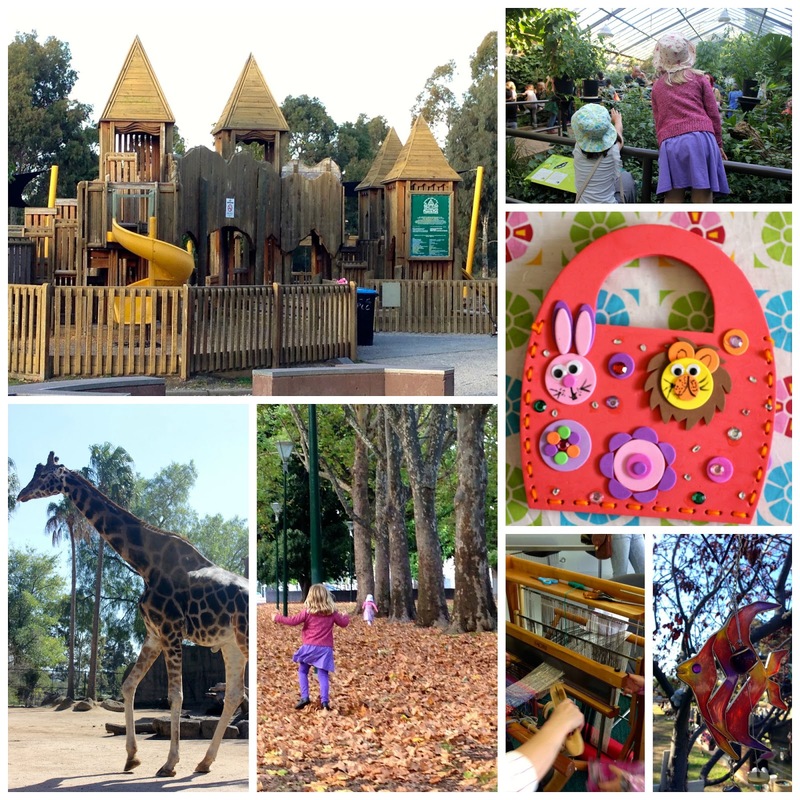 And with the end of the school holidays I will leave you with some photos and words to sum up the fun we had: the zoo, autumn leaves, Easter, weaving, craft, play dates, cinema, sleepovers, monkey bars, cousins, Phoenix park, bike rides, friends, queues, playgrounds, dolls, swimming, chocolate, baking. 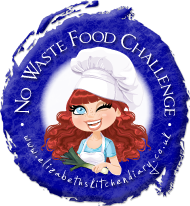 I am sending this recipe that rescued the caramel to Elizabeth's Kitchen for the No Waste Food Challenge. 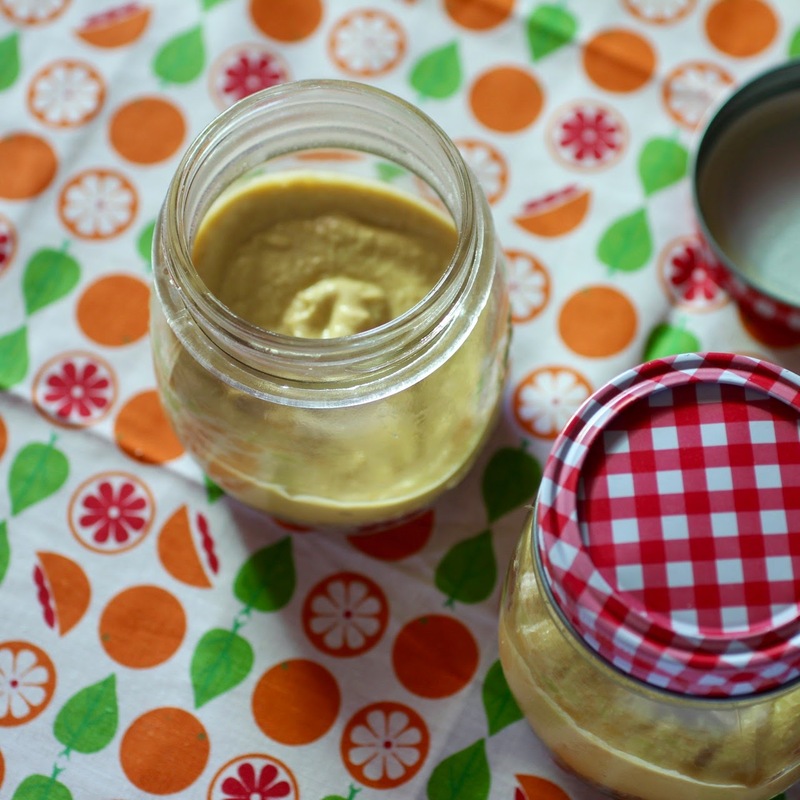 Cream butter and maple syrup. Beat in dulce de leche and salt. Gently mix in flour then chocolate. Drop heaped teaspoons on baking paper lined oven trays. Bake for 10 to 12 minutes until just starting to turn golden brown on the edges. Rest 5 to 10 minutes before transferring to a wire rack to cool (I keep them on the baking paper while cooling).